Two sets of rules are printed below. The existing Central Council rules appear first and are in light type, whilst the proposed amended rules following, in numerical order, are in bold (black) type. The Council shall be known as “The Central Council of Church Bell Ringers”. (i) Use its best endeavours to grant guard the rights and promote the welfare of the Exercise both in its scientific aspect and as a branch of church work. (ii) Encourage and assist the development of the Art in its scientific and historical branches. (iii) Arbitrate as far as may be deemed advisable in such matters of dispute or perplexity as may be submitted to its judgement. (i) To promote and foster the ringing of bells for Christian Worship and on other appropriate occasions. (ii) To represent all ringers to national bodies and the world at large. (iii) To make available advice, assistance and information to ringers and ringing societies on all matters concerned with bells and bell ringing. (iv) To bring together ringers to discuss matters of common interest. (v) To recommend standards in change ringing and maintain such records as may be necessary to uphold these standards. (1) Of Representative Members elected by affiliated Societies. (2) Of Honorary Members, not exceeding 24 in number, elected by the Council. (1) Representative Members elected by affiliated societies. (2) Honorary Members, not exceeding 24 in number, elected by the Council. (i) Any Society, Association or Guild of Church Bell Ringers (hereinafter referred to under the general term “Society”) numbering not fewer than seventy-five members, shall upon application and subject to election by a majority of two-thirds of the members present and voting be affiliated to the Council and shall subscribe to an undertaking loyally to abide by the rules and decisions of the Council. (ii) The Societies which are affiliated to the Council at the date of the passing of these Rules and the number of their permitted Representatives at that date are specified in the Schedule to these Rules. (iii) Societies hereafter applying for affiliation shall be classified as either Territorial or Non-Territorial. In deciding whether such a Society is to be classified as Territorial or Non-Territorial, the Council shall regard as Non-Territorial a Society whose members are drawn from an unlimited area or from an area already represented by one or more Territorial Societies. (i) Any Society, Association or Guild of Church Bell Ringers (hereinafter referred to under the general term “Society”) numbering not fewer than seventy-five members, shall upon application and subject to the agreement of two-thirds of the members present be affiliated to the Council and shall subscribe to an undertaking loyally to abide by the rules and decisions of the Council. (iii) Societies shall be classified as either Territorial or Non-Territorial. The Council shall regard as Non-Territorial a Society whose members are drawn from an unlimited area or from an area already represented by one or more Territorial Societies. (a) A Territorial Society, the number of whose members is 75 or over, but does not exceed 150, one Representative Member; exceeds 150 but does not exceed 300, two Representative Members; exceeds 300 but does not exceed 450, three Representative Members; exceeds 450, four Representative Members. Four Representatives shall be the limit of Representation allowed any one Society. For the purpose of this rule the basis of the calculation of membership for Territorial Societies shall be the number of honorary and ringing members, and resident life members at the time of the election of Representative Members. That number in respect of either the year of election or (if more readily ascertainable) the year preceding the election shall be certified in writing by the Secretary of the Territorial Society to the Secretary of the Council on demand. (b) Those Societies hereafter affiliated who are classified as Non-Territorial shall be entitled to one member per Society. (ii) The representation of Non-Territorial Societies now affiliated to the Council shall be as specified in the Schedule to these Rules unless modified on application to and by permission of the Council. (iii) No Representative Member shall be eligible as an Honorary Member. (iv) The election of Representative Members by affiliated societies shall take place triennially, and the names and addresses of those elected shall be forwarded to the Secretary of the Council not later than four weeks before the commencement of each triennial session. In the event of a vacancy the new member shall be elected only for the unexpired period of the triennium, and his name and address shall be forwarded to the Secretary of the Council forthwith. For the purpose of this rule the basis of the calculation of membership for Territorial Societies shall be the number of honorary and ringing members, and resident life members at the time of the election of Representative Members. That number in respect of either the year of election or (if more readily ascertainable) the year preceding the election shall be certified in writing by the Secretary of the Territorial Society to the Secretary of the Council. (iv) The election of Representative Members by affiliated societies shall take place triennially, and the names and addresses of those elected shall be forwarded to the Secretary of the Council together with the Certificate required by Rule 5 (i) (a) not later than four weeks before the commencement of each triennial session. In the event of a vacancy the new member shall be elected only for the unexpired period of the triennium, and his name and address shall be forwarded to the Secretary of the Council forthwith. Honorary Members shall be elected for three years and, on retiring, shall be eligible for re-election (retirement and election taking affect as from the end of the annual meeting), provided that any Honorary Member who during his term of office may be elected a Representative or Life Member shall, ipso facto, vacate his honorary membership. The Council may fill a vacancy among the Honorary Members at any annual meeting of the Council. Honorary Members shall be elected for three years and, on retiring, shall be eligible for re-election (retirement and election taking effect as from the end of the annual meeting), provided that any Honorary Member who during his term of office may be elected a Representative or Life Member shall, ipso facto, vacate his honorary membership. The Council may fill a vacancy among the Honorary Members at any annual meeting of the Council. (b) Those who in the opinion of the Council (expressed by a two-thirds majority of those present and voting) by reason of their services to the Art of Ringing merit the conferment on them of the honour of Life Membership. Life Membership shall cease only on death or resignation. (ii) All nominations for Life Membership under sub-paragraph (i) (b) of this paragraph shall be sent to the Honorary Secretary signed by two members of the Council not less than two calendar months previous to a meeting of the Council unless notice of motion has been given at the previous meeting. Such nominations shall appear on the agenda paper. (i) Life Members shall consist of those who in the opinion of the Council (expressed by the agreement of four-fifths of those present) by reason of their services to the Art of Ringing merit the conferment on them of the honour of Life Membership. Life Membership shall cease only on death or resignation. (ii) All nominations for Life Membership shall be sent to the Honorary Secretary signed by two members of the Council not less than two calendar months previous to a meeting of the Council, unless notice of motion has been given at the previous meeting. Such nominations shall appear on the agenda paper. All Affiliated Societies shall subscribe annually, on January 1st for the year commencing on that date, 10s. on behalf of each Representative Member to whom they are entitled, to meet the expenses of conducting the business of the Council, and no Representative Member shall be entitled to speak or vote at a meeting of the Council until the subscription of the Society he represents be paid. All Affiliated Societies shall subscribe annually, on January 1st for the year commencing on that date, such sum as the Council may from time to time determine on behalf of each Representative Member to whom they are entitled, to meet the expenses of conducting the business of the Council. No Representative Member shall be entitled to speak or vote at a meeting of the Council until the subscription of the Society he represents be paid. The Council shall meet once annually, about Whitsuntide, in some convenient centre, as decided upon by the Council at a previous meeting, or (in the event of unforeseen circumstances rendering the Council’s decision impracticable) as the Standing Committee of the Council shall decide. Any meeting of the Council may be extended to additional sittings on the same or the following day on a motion for adjournment being put and carried. The President shall have power, in case of emergency, to call special meetings of the Council, and he shall at any time summon such a special meeting on receipt of a requisition signed by twelve members. The Council shall normally meet once annually, the venue and date to be decided at a previous meeting, or (in the event of unforeseen circumstances rendering the Council’s decision impracticable) as the Administrative Committee of the Council shall decide. Any meeting of the Council may be extended to additional sittings on a motion for adjournement being put and carried. The President shall have power, in case of emergency, to call special meetings of the Council, and he shall at any time summon such a special meeting on receipt of a requisition signed by twenty-five members. At the Annual Meeting next after each Triennial Election a President, Vice-President, an Honorary Secretary (who shall also act as Treasurer) and an Honorary Librarian shall be elected from among the members to serve for three years. In the event of the President, Vice-President, Honorary Secretary or Honorary Librarian vacating office before the expiration of the three years, the ensuing meeting shall elect a member to fill the vacancy during the remainder of the period. The retiring President, Vice-President, Honorary Secretary and Honorary Librarian shall be eligible for re-election at the expiration of their term of office. The President shall retire from the chair immediately his successor in office is elected, but the Honorary Secretary and Honorary Librarian shall continue in office till the business of the meeting is concluded. All nominations for these offices shall be sent to the Honorary Secretary, signed by two members of the Council, not less than two calendar months previous to the meeting, and such nominations shall appear on the agenda paper. The next business after the election of the President, Vice-President, Honorary Secretary and Honorary Librarian shall be the election of Honorary and Life Members. (i) At the Annual Meeting next after each Triennial Election a President, Vice-President, an Honorary Secretary (who shall also act as Treasurer) and an Honorary Librarian shall be elected to serve for three years. In the event of the President, Vice-President, Honorary Secretary or Honorary Librarian vacating office before the expiration of the three years, the ensuing meeting shall fill the vacancy for the remainder of the period. The retiring President, Vice-President, Honorary Secretary and Honorary Librarian shall be eligible for re-election at the expiration of their term of office. The president shall retire from the chair immediately his successor in office is elected, but the Honorary Secretary and Honorary Librarian shall continue in office till the business of the meeting is concluded. All nominations for these offices shall be sent to the Honorary Secretary, signed by two members of the Council, not less than two calendar months previous to the meeting, and such nominations shall appear on the agenda paper. (ii) The President, Vice-President, Honorary Secretary and Honorary Librarian shall be ex-officio members of the Council if not already Life, Honorary or Representative Members. The Council shall triennially elect from amongst the members of the Council two Auditors who shall audit and report upon the Annual Accounts of the Council with power to employ the services of a professional accountant at the expense of the Council to audit the whole or any particular part of the accounts of the Council. The Council shall triennially elect from amongst the members of the Council two Auditors who shall audit and report upon the Annual Accounts of the Council except the “Ringing World” Accounts, provided that they shall be entitled to examine the audited accounts of the “Ringing World” in so far as is necessary for them to discharge their duties. The Auditors shall have power to employ the services of a professional accountant at the expense of the Council. In the event of the auditors vacating office before a triennial election, the Administrative Committee shall fill the vacancy. (i) The Council shall appoint a Standing Committee and shall have power to appoint Committees for any purpose for which it may appear desirable and also, if the state of the funds permit, to allow the necessary expenses of holding the Committee Meetings. Each Committee shall appoint a convener and shall report annually to the Council. All reports, except that of the Standing Committee, shall be made in writing to the Honorary Secretary by not later than 31st March, before the meeting. (a) Present and past holders of the office of President, Honorary Secretary and Treasurer and Honorary Librarian of the Council and the Vice-President for the time being. (b) Honorary Auditors and Conveners of Committees ex-officio. (c) Twelve elected members (chosen by ballot if more than twelve names are proposed). The Committee shall have power to co-opt not more than two other members of the Council. (iii) At the Annual Meeting next after each Triennial Election, members of any Committee who have not been re-elected to the Council shall (when such Committee has a report to present) have the right to attend and speak on any matter arising exclusively out of that report. (i) The Council shall at the Annual Meeting next after each triennial election, appoint an Administrative Committee and the permanent committees enumerated in paragraph (ii) of this Rule and such other committees as are necessary to carry out the work of the Council. The Council may at any time dissolve a committee or alter its membership. Reasonable expenses may be paid. (ii) The following committees shall be the permanent committees of the Council. (a) The President, Vice-President, Honorary Secretary and Treasurer of the Council. (b) The Chairmen of Committees. (iv) The other committees shall normally consist of not more than five elected members (chosen by ballot if more than five names are proposed). The Council may exceptionally add to this number. (v) Each committee shall appoint a chairman and shall report annually to the Council. All reports, except that of the Administrative Committee, shall be made in writing to the Honorary Secretary where possible by 28th February before the Council meeting. (vi) A Committee may establish an advisory panel of consultants to assist them with their activities and shall be solely responsible for appointments to the Panel. (vii) At the Annual Meeting next after each Triennial Election, members of any Committee who have not been re-elected to the Council shall (when such Committee has a report to present) have the right to attend and speak on any matter arising exclusively Out of that report. To organise the meetings of the Council, co-ordinate the activities of other committees and deal with urgent matters between meetings of the Council. To maintain an account of the work and general ringing activities of past and present members of the Council. To disseminate knowledge on ringing matters by organising or assisting societies to organise courses and lectures, and to keep under review the need for providing suitable literature and other aids for teaching purposes. To consider and advise on all questions arising from the interpretation of the Council’s decisions relating to methods, calls and peal ringing. To maintain a record of the first peal in each method on each number of bells for both tower bells and handbells and subsequent record length peals together with compositions used; a record of new methods included in multi-method peals; and a record of the progressive number of methods rung in peals of different groups of methods. To prepare an analysis of and report on all peals published in the “Ringing World”. To maintain a representative collection of compositions of 5,000 changes and upwards and prepare for publication such collections as the Council shall direct. To liaise with the Press and Broadcasting Organisations and project the ringing image to the public; to keep in touch with ringers overseas by the appointment of one of its members as Overseas Liaison Officer. To ensure that suitable publications are available to further the aims of the Council and, where appropriate, to be responsible for their distribution. (a) To ensure that the official journal of the Council. “The Ringing World”, is published weekly as far as possible and to be responsible for its general management. To this end the Committee may appoint an Editor and provide any necessary assistance for him; appoint an Honorary Treasurer; and appoint professional accountants to audit and report to them on their accounts, such report to be made available to the President of the Council. (b) To prepare for each Annual Meeting of the Council the audited accounts for the previous calendar year. To make available advice and assistance on, and information about, the installation, maintenance and security of rings of bells, the maintenance of towers and all related matters. The property funds and assets of the Council shall be vested in the President, Honorary Secretary and Honorary Librarian for the time being. They shall have power to invest money and adopt such measures as seem to them necessary in the interest of the Council subject to the approval of the Council. The property funds and assets of the Council shall be vested in the President, Vice-President and Honorary Secretary for the time being. They shall have power to invest money and adopt such measures as seem to them necessary in the interest of the Council, consulting where appropriate the Chairman of the “Ringing World” Committee. All resolutions to be proposed shall be sent to the Honorary Secretary in writing signed by two members of the Council, not less than six weeks previous to the meeting, and shall be placed by him on the agenda, together with the names of the proposer and seconder of the resolution. But it shall be competent, on a vote of the majority of the meeting, for the Council to discuss a subject not upon the agenda paper, provided such subject does not affect the rules or constitution of the Council. All notices of motion shall be sent in writing signed by two-members of the Council, received by the Honorary Secretary not less than six weeks previous to the meeting, and be placed by him on the agenda, together with the names of the proposer and seconder of the motion. But it shall be competent, on a vote of the majority of the meeting, for the Council to discuss a subject not upon the agenda paper, provided such subject does not affect the rules or constitution of the Council. At the meetings of the Council the President or Vice-President shall take the chair, and in the event of their absence the members present shall elect a Chairman for that meeting. The Chairman shall have a casting vote. Twenty members shall form a quorum. Every new member, whether Representative or Honorary or Life, shall, before taking his seat, be introduced by a member to the President or Vice-President or, in the absence of the President or Vice-President, to the Chairman of the meeting. (i) At the meetings of the Council, the President or Vice-President shall take the chair and in the event of their absence the members present shall elect a Chairman for that meeting. (ii) The next business after the election of the President, Vice-President, Honorary Secretary and Honorary Librarian shall be the election of life and Honorary Members. (iii) Fifty members shall form a quorum. Each member, whether Representative, Honorary or Life, shall have one vote. Each member present, whether Representative, Honorary, Life or Ex-Officio. shall have one vote. The Chairman for the time being shall have a casting vote. Provisional notice of the date and items for discussion at the Annual Meeting shall be given approximately nine weeks previous to such meeting. Full notice of the date, arrangements, and agenda for each meeting shall be given not less than four weeks previous to such meeting. Such notice shall be given in “The Ringing World” but it shall not be incumbent on the Honorary Secretary to send notice to each member. The names of the members present and the business transacted at each meeting shall be entered in the minute book and reported to “The Ringing World”. Copies of the resolutions passed by the Council and of the decisions of the Council shall be forwarded to the Affiliated Societies as soon as is convenient after the meeting. Provisional notice of the date and items for discussion at the Annual Meeting shall be given approximately nine weeks previous to such meeting. Full notice of the date, arrangements, and agenda for each meeting shall be given not less than four weeks previous to such meeting. Such notice shall be given in “The Ringing World” and it shall not be incumbent on the Honorary Secretary to send notice to each member. The names of the members present and the business transacted at each meeting shall be entered in the minute book and reported to “The Ringing World”. Copies of the resolutions passed by the Council and of the decisions of the Council shall be forwarded to the Affiliated Societies as soon as is convenient after the meeting. At each Annual Meeting the Honorary Secretary and Treasurer shall submit the audited statement of accounts for the year to the previous 31st December and the Auditors’ Report for adoption by the meeting. At each Annual Meeting the Honorary Secretary and Treasurer shall submit the audited Statement of all accounts of the Council for the year ending 31st December previous, together with the Auditors’ Report. Alterations in the Rules of the Council shall be made only at the Annual Meetings, and every notice of a proposed alteration shall be sent to the Honorary Secretary as laid down in Rule 14. All alterations in the Rules of the Council shall be passed by a majority of two-thirds of those present and voting. Alterations in the Rules of the Council shall be made only at the Annual Meetings, and every notice of a proposed alteration shall be sent to the Honorary Secretary as laid down in Rule 17 Rule 15. All alterations in the Rules of the Council shall require the agreement of two-thirds of those present. Notice is given pursuant to Rule 14, subject to the acceptance of the report of the Standing Committee, that the foregoing proposed rules shall be substituted for the existing rules. Because this is my last report to the Council, I think I ought to write at greater length than I did last year. I am presenting it with mixed feelings - sadness because I have found it necessary to terminate the engagement prematurely and relief in that I shall be reducing a burden of work which had become unreasonably heavy. When I undertook this task in 1966 I could not possibly have foreseen the changes which have since taken place in my business life. In 1970 I became inundated with professional work and at the same time I lost the facility of having a shorthand typist for Council work. This happened at the time when the constitution investigation was creating additional work, and it was therefore in the nature of a last straw. I have always held that voluntary work is just as important a part of life as stipendiary work. Indeed, I claim that throughout this trying period Council work was never neglected. There were many occasions when it was given priority, possibly because I found it more congenial than dealing with tiresome enquiries from Her Majesty’s Inspectors of Taxes. I am pleased to have had this opportunity of serving the Council and it was gratifying to have shared in the planning, from the host side, of innovations which gave pleasure at Ilkley and which appear likely to become standard practice for future meetings. In similar vein, it has been rewarding to have been involved in the revision of the constitution. I am well aware that some members have thought my approach to public relations not above reproach. I would therefore like it to be known that the discontinuance of the eve of Council Standing Committee meeting was my suggestion which that committee decided to adopt. I am convinced that this non-arrangement contributed even more to a cordial atmosphere at Ilkley than the Yorkshire hospitality. I very much regret that pressure of work has rendered it impossible for Jeanne and me to attend as many social functions as we would have liked. Our geographical location has been a disadvantage in this respect. I hope my successor will find it easier to “show the flag”. I wish to record thanks to those whose hospitality we have enjoyed, to my fellow officers for their forbearance, to many members for their encouragement, and to Jeanne for all the help which was expected and was at all times readily forthcoming. We both hope that we shall not be misunderstood by our intention to resign as from the end of the Leamington Spa meeting. As far as Jeanne is concerned, there has for a long time been a tacit understanding that honorary membership should be synonymous with work. In my own case the way is clearly pointed by the proposed revisions to which I have subscribed, and I consider it would be improper for me to take the other course. During the year 1970 members of the committee received requests for inspections and/or advice from 109 churches. Owing to the postal strike it has not been easy to obtain statistics in full from all our members, and some had to be given by telephone, so that the summary of the committee’s work may be briefer than usual. Of the total requests received, 14 were dealt with by correspondence, the others by visits to the churches concerned. These were situated as follows: Bedfordshire (A.J.F., 1; F.S., 1) 2, Berkshire (F.S.) 10, Buckinghamshire (F.S.) 3, Cambridgeshire (B.D.T.) 4, Cheshire (F.S.) 1, Devonshire (J.G.M.S.) 7, Dorsetshire (F.E.C.) 4, Essex (A.J.F.) 1, Glamorganshire (T.M.R.) 2, Gloucestershire (F.S.) 11, Hampshire (F.E.C., 2; F.S., 1) 3, Herefordshire (F.S.) 1, Hertfordshire (A.J.F.) 4, Huntingdonshire (B.D.T.) 1, Lincolnshire (J.F.) 4, London (A.J.F., 5; F.S., 1; B.D.T., 1) 7, Northamptonshire (B.A., 4; F.S., 1) 5, Oxfordshire (F.S.) 3, Somersetshire (H.S., 21; J.G.M.S., 1) 22, Staffordshire (F.S.) 1, Surrey (A.J.F.) 1, Wiltshire (F.E.C., 3; F.S., 1) 4, Warwickshire (B.A., 1; F.S., 2) 3, Yorkshire (B.D.T., 3; F.S., 1) 4, Scotland (A.J.F. and B.D.T.) 1. Total 109. If we add to these the two instances when general advice on bell restoration was given to church architects, not specifically on any one tower, the total is 111. Repairs and maintenance, 56 churches; minor work to bell installations, 34; tuning bells, 17; sound control and acoustics, 38; rehanging in new frames, 25; rehanging in existing frames, 16; recasting bells, 14; augmentation of rings, 9; structural repairs to towers, 22; oscillation of towers, 7. Advice was also given on disposal of bells from a redundant church, and a proposal to install recorded bells was withdrawn on the advice given in another church. One of our members gave evidence resulting in the conviction of a thief who stole bells from an Exeter church. On another occasion we were asked for advice on financing a restoration scheme, which is somewhat outside the scope of our committee. The Rev. J. G. M. Scott succeeded in getting a mediæval frame and the gear of three bells preserved in a Devon museum, and the convener gave evidence on one occasion in a Consistory Court. Also, during the inspection of bells and towers in preparation for writing additional county books, the convener gave verbal advice on bell maintenance to steeple-keepers and other church officers in over 50 churches. The MSS. of the proposed new “Towers and Belfries Handbook” have been completed, and at its last meeting the committee approved the final draft for publication. It is hoped to publish the book this year. Rev. J. G. M. SCOTT, M.A. B. D. THRELFALL, M.A., M.I.C.E. This committee functions in two ways. It undertakes projects and it provides a source of information. Projects are generally undertaken by individuals or small groups while information is disseminated chiefly by the convener. The change in committee personnel made at Ilkley more or less coincided with the completion of two projects - the tutor’s handbooks and the good striking record. In both the retiring convener did much hard work, and his successor is taking advantage of the postal strike, with the consequent lack of signatures to this report, to refer to the prodigious amount of time and energy Mr. Norman Chaddock has used since this committee came into being. Two new projects are under way: (1) Mr. W. Butler is going to make a survey of ringing, on the same lines as that of 1958 but with a slightly revised questionnaire. The survey will probably be selective. (2) A film-strip, with notes, on the casting, tuning and hanging of bells, is being made with the kind co-operation of John Taylor and Co. Ltd., the Whitechapel Bellfoundry and Mr. F. White, of Appleton. The work is being done by two members of the Central Council - Mr. W. L. Exton is taking the photographs and Rev. J. G. M. Scott is writing the notes. The committee is very grateful to both gentlemen for their work on its behalf. The strip will be on sale in due course and it is suggested that guilds and associations may like to buy two or three copies for lending to their members. It will be on sale to individuals too, of course. Other projects in mind are (a) a week’s summer school, suggested by Mr. D. Beacham, of Worcester (the chief problem is to find suitable accommodation); (b) duplicating notes, diagrams and aids to ringing for distribution at cost; (c) producing tape-recordings of aids to learning. The matter of courses in other parts of the country than Hereford, organised by the committee, was raised at Ilkley. This is not easy. Many guilds and associations organise their own courses and this committee has no intention of interfering in local arrangements. (The Hereford course, now practically a permanent booking at the College of Education, for three days in April, is, in fact, almost entirely organised by the Hereford Diocesan Guild’s general secretary.) The proposed conference on education in ringing, advertised last autumn in The Ringing World, produced only two or three responses and has had to be cancelled this time. Mr. N. Chaddock is organising a course at Grantley Hall, Yorkshire, in November, 1971. Washington Film (16 mm. sound colour film of the cathedral church and its bells). This has been on hire five times in 1970, with a net income of £5. A new spool and mailing box have been bought. Generally the film is in good condition. Applications for hire (now £1.05, including postage one way) to Mr. N. Chaddock, 11 Springdale Road, Market Weighton, York. Gramophone Record of Examples of Good Striking. 263 records were sold and a surplus of almost £30 paid to the Council’s treasurer. A questionnaire sent with each record produced 55 replies and these indicate that the record has been well received. Rev. R. D. St. John Smith has kindly undertaken to pursue the work of the committee in this field. The committee welcomes suggestions and enquiries. In particular, constructive criticisms of the Tutor’s Handbooks would be appreciated at this time, as reprinting of both parts is being considered. T. H. Francis.- Society of Royal Cumberland Youths 1948-1949, 1951-1956. Died March 8, 1970. Attended four meetings. W. Shepherd.- Winchester and Portsmouth Diocesan Guild 1920-1923; Guildford Diocesan Guild 1928-1929. Died April 23, 1970. Attended three meetings. S. T. Price.- Gloucester and Bristol Diocesan Association 1945-1950. Died December 16, 1970. Attended three meetings. T. H. Francis died under tragic circumstances in a motoring accident, aged 56. He was a good conductor of Stedman, on all numbers. W. Shepherd was born, and learned to ring, in Exeter. He conducted the first handbell peal for the Devon Guild. His longest length was 19,738 Stedman Caters, in hand. Until quite recently he was a regular contributor to The Ringing World. The borrowing of books from the Council’s library in 1970 was much the same as in the previous year, and I am happy to report a marked improvement in the return of books by members who have kept them for unreasonably long periods. The outstanding event of the year was the publication by Kingsmead Reprints, of Bath, of a facsimile edition of the Tintinnalogia, of 1668. As instructed by the Standing Committee, I took out a bond in the sum of ten thousand pounds for the safe return of the original edition, and remained in the printing works while it was photographed. Members may remember that on presenting the book to the Council the late Mr. E. H. Lewis stipulated that it must not leave the librarian’s possession. During the year the library has acquired by purchase copies of the reprint of The Church Bells of Wiltshire, by H. B. Walters, and Mr. G. P. Elphick’s excellent new book, Sussex Bells and Belfries, and by donation copies of the following: Ropesight, 13th edition, by J. W. Snowdon, given by Mr. Christopher Groome; The Irish Bell News, from Mr. F. E. Dukes, and Volume III of The Church Bells of Herefordshire, from the author. Restrictions on use of the formula in expanding extension, regarding places in 12, and methods with lead position at the half-lead. Restrictions on the use of the formula in static extensions, regarding places adjacent to the treble’s path, and methods with lead or penultimate position at the half-lead. Relation between different types of lead heads on different numbers of bells, such as Plain Bob type, Canterbury type, Hunslet type, etc. The need, if any, for pivot bell sequence restrictions. At the Central Council meeting at St. Albans in 1969 it was resolved that the Standing Committee should examine the constitution and procedural working of the Council. To this end three sub-committees were subsequently appointed by the Standing Committee to consider and make recommendations on certain aspects of the Council’s activities. The reports of the sub-committees were accepted by the Standing Committee and presented to the Council by that committee at the meeting at Ilkley in 1970 as an interim report. The Standing Committee has given further consideration to the matter in the light of comments made at Ilkley and now presents this consolidated report. (a) To promote and foster the ringing of bells for Christian worship and on other appropriate occasions. (b) To represent all ringers to national bodies and the world at large. (c) To make available advice, assistance and information to ringers and ringing societies on all matters concerned with bells and bellringing. (d) To bring together ringers to discuss matters of common interest. (e) To recommend standards in change-ringing and maintain such records as may be necessary to uphold these standards. (f) To assist in the provision, maintenance and transfer of church bells. In framing (a) above the Committee took note of the Council’s view that its primary purpose is concerned with ringing for Sunday services. Objects (b), (c) and (d) are as presented to the Council last year; objects (e) and (f) were revised at our meeting on October 24, 1970, replacing the former (e), (f) and (g). A proposed new Rule 2 is at Annex A. (a) Decide on the extent and nature of its membership, having regard to the constitution of its affiliated societies and the need to ensure the availability of specialist advice and assistance. (b) Elect officers and committees and delegate authority to them as appropriate. (d) Control its finance and property. (a) The numerical basis of election of representative members should remain as at present. (b) Honorary membership should continue at the present level, it being understood that those concerned are normally elected to carry out a specific task. (c) Life membership should cease to be conferred automatically on holders of the office of President, Honorary Secretary or Honorary Librarian. The President, Vice-President, Honorary Secretary and Treasurer and Honorary Librarian should, however, be ex-officio members of the Council if not already life, honorary or representative members. (d) Election to life membership should require the agreement of four-fifths of the members present at the meeting (not simply four-fifths of those voting). (b) We feel that election to life membership should be by a positive rather than a negative expression of the Council’s wishes. To require, e.g., a four-fifths majority of those “present and voting” could mean election by a handful of members with the remainder abstaining. RULE 7. With the foregoing in mind a proposed amended Rule 7 is at Annex A. OFFICERS. We think the principal officers should be the President, Vice-President and Honorary Secretary and Treasurer. Important though the office of Librarian is, it is not concerned with the administration of the Council. We refer again to the question of the Library in paragraph 17 below. COMMITTEES. We recommend that the Council should consist of the following standing committees with responsibilities as shown, but that it may appoint other temporary or permanent committees to meet a particular need. (a) ADMINISTRATIVE COMMITTEE. To organise the meetings of the Council, co-ordinate the activities of other committees and deal with urgent matters between meetings of the Council. (b) BIOGRAPHIES COMMITTEE. To maintain an account of the work and general ringing activities of past and present members of the Council. (c) EDUCATION COMMITTEE. To disseminate knowledge on ringing matters by organising, or assisting others to organise, courses and lectures and to keep under review the need for providing suitable literature and other aids for teaching purposes. (d) METHODS COMMITTEE. To consider and advise the Council on all questions arising from the interpretation of the Council’s decisions relating to methods, calls and peal ringing. (e) RECORDS COMMITTEE. To maintain a record of the first peal in each method on each number of bells for both tower bells and handbells, and subsequent progressive length peals, together with compositions used; a record of new methods included in multi-method peals; and a record of the progressive number of methods rung in peals of different groups of methods. (f) PEALS ANALYSIS COMMITTEE. To prepare an analysis of and report on all peals rung in each calendar year submitted to “The Ringing World” by the end of January in the following year. (g) PEAL COMPOSITIONS COMMITTEE. To maintain a representative collection of compositions of 5,000 changes and upwards and prepare for publication such collections as the Council may direct. (h) PUBLIC RELATIONS COMMITTEE. To liaise with the Press and Broadcasting organisations and project the ringing image to the public; to keep in touch with ringers overseas by the appointment of one of its members as Overseas Liaison Officer. (i) PUBLICATIONS COMMITTEE. To ensure that suitable publications are available to further the aims of the Council and, where appropriate, to be responsible for their distribution. To ensure that the official journal of the Council, “The Ringing World”, is published weekly as far as possible, and to be responsible for its general management. To this end the Committee may appoint an Editor and provide any necessary assistance for him; appoint an honorary treasurer; and appoint professional accountants to audit and report to them on their accounts, such report to be made available to the President of the Council. To prepare for each annual meeting of the Council the audited accounts for the year ending on the previous 31st December. NOTE - The Committee will be responsible for payment for such professional services as they employ. (k) TOWERS AND BELFRIES COMMITTEE. To make available advice and assistance on and information about the installation and maintenance of rings of bells, the maintenance of towers and all related matters. (a) Past officers and existing honorary auditor should not be ex-officio members of the Administrative Committee (as they have been hitherto of the Standing Committee). (b) Other committees should normally consist of not more than five elected members. (c) No committee should have the power to co-opt members. FUNCTIONS OF COMMITTEES. Committees should report annually to the Council, but in addition we think those committees whose work lends itself to public discussion - and here we have in mind particularly those dealing with technical matters - should be encouraged to hold open meetings. i.e., not confined to members of the Council, at which their ideas can be described and discussed. We also propose that the Administrative Committee should, except in an emergency, continue the Standing Committee’s recent practice of meeting once or twice annually but not on the eve of the Council meeting. MEETINGS OF THE COUNCIL. We think the Council should continue normally to meet once annually but that it should decide at each meeting the date of the following year’s meeting, which need not necessarily be “about Whitsuntide”. In deciding upon the date the Council would, of course, be guided by the wishes of the society in whose territory the meeting is to be held, the actual meeting place being entirely a matter for that society. While it is, of course, for the host association to decide, we would prefer to continue the recent practice of not having greetings by local dignitaries on the meeting day. PROCEDURE. The Council’s formal business should follow existing lines, but ad hoc meetings on preceding days should be encouraged where it is thought desirable to test public opinion on matters not the prerogative of a particular Committee (which are covered by paragraph 11 above). We think it is important that such meetings should not take place as a matter of routine because of the danger that every Council meeting will be held twice. PERIOD OF COUNCIL. We see no reason to alter the existing three-year period of each Council. LIBRARY. The Council has so far been fortunate in that successive librarians have been able to provide the necessary space to house the library. This may not always be so and therefore enquiries have been made of a national library to ascertain the conditions under which the Council’s library could be housed. In general terms it would appear that it would be on permanent loan to the national body and that the books would have to be available to borrowers generally. Manuscripts would be subject to special arrangements. It is recommended that an ad hoc committee be elected to investigate this matter and the related ones of archives and sound recordings. INCOME AND EXPENDITURE. The view has hitherto been taken that as far as its general funds were concerned the Council merely needed to make ends meet. If exceptional calls were made on its resources in any one year (generally to meet bills for new publications) money was borrowed from the funds of “The Ringing World” and repaid as soon as practicable. (a) The Publications Account should not subsidise the General Fund, but profits should be retained on a separate capital account. The Account should, however, pay “The Ringing World” for advertisements at two-thirds of the full rate. Tax payable on profits arising from certain sales should be charged to the Account. (b) Any other Council advertisements, and the cost of reprinting the Agenda and Minutes for circulation to members, should be charged to the Income and Expenditure account. (a) Meeting from its own funds the cost of essential expenditure, estimated as of the order of £100, on Council meetings, which is at present borne by the host association. (b) Devising a national scheme for providing assistance to churches for any work connected with bells. (c) Ascertaining whether the Council could be registered as a charity. (d) Enlarging use of the Clement Glenn Fund. (e) Increasing the affiliation fee, unchanged at ten shillings per member since 1954, to cover increased calls on the General Fund arising from paragraphs 19 and 20 (a) above, estimated at about £205 p.a. ; such increase possibly to be phased over five years. In connection with paragraph 20 (b), a statistical study is being made of the organisation and assets of Bell Restoration schemes. VESTING OF PROPERTY. To accord with paragraph 8 above we recommend that the property funds and assets of the Council should be vested in the President, Vice-President and Honorary Secretary for the time being, who should collectively have absolute responsibility for taking any measures they deem necessary (although where appropriate and practicable they would first consult the convener of “The Ringing World” Committee). A proposed amendment to Rule 15 (as renumbered) is at Annex A. LEGAL LIABILITY. We reproduce at Annex B Mr. W. B. Cartwright’s advice on this subject. Rule 19 - that affiliation to the Council and alteration in the Rules should require the agreement of two-thirds of the members present. The arguments for this are as set out in paragraph 6 (b) regarding life membership. Rule 5 (iv) - that membership of territorial societies shall be certified triennially instead of on demand. Rule 8 - to enable annual subscriptions to be altered without requiring an amendment to the Rule. Rule 9 - reference to Whitsuntide has been deleted and the number of members needed to requisition a special meeting has been increased to 25. Rule 15 - to dispense with the introduction of new members to the President, thus regularising present practice. We seek the agreement of the Council to the action set out above. At the meeting of the Standing Committee held at Nottingham at Whitsuntide last I was asked to consider and advise upon the question of the personal liability of members of the Council in respect of contracts or other liabilities entered into by the Council as a whole. The Central Council is clearly an unincorporated body; it has no existence independent of the members for the time being comprising it; it is not a legal entity capable of suing or being sued in its own name. Accordingly any legal liabilities whether in contract or in tort incurred by or on behalf of the Central Council are liabilities of each and every member of the Central Council at the moment the liability is incurred: provided of course that the actual individual or individuals by whom that liability is incurred are at the time acting on behalf of the Central Council; if he is or they are acting outside their ostensible or actual authority the liability is his or their own. To illustrate by way of example: if the Hon. Secretary or a committee is authorised by the Central Council either expressly or by implication to have printed a new edition of the handbook, the responsibility for the printers’ bill is that singly and collectively of every member of the Central Council at the time the debt was incurred. But if the Hon. Secretary or a committee found irresistible an urge to view a new ring of bells in Australia, the travelling expenses thereby incurred would be their own, and the Central Council’s entire membership would not be liable for them unless they had expressly or impliedly authorised those expenses. Three demonstrations have been given to a total of 66 visitors and touches called in eight methods, with some “audience participation”, Apart from a broken pawl spring, which was replaced, the machine has functioned well. We are very indebted to Mr. and Mrs. Dobbie who continue to give much of their time and have taken over the demonstrations, which are more fruitful than they have ever been. It is a rare thing to find The Church Times devoting space to a full-scale article on bell-ringers and their work. This apparent neglect may be due to the fact that the ringing fraternity (like the psalmist) does not exercise itself in great matters which are too high for it, engages in no doctrinal disputes, but confines itself to the work of assisting the Church in its worship and proclaiming the Gospel abroad in its own particular fashion. The part it plays (like that of the choir) is so obvious that it does not need (or, indeed, desire) any special comment. It is refreshing, nevertheless, to find in The Church Times of November 20 a prominent essay by Rex Butler, headed “Church Bells: are they becoming a silent heritage?”. The article is thoughtfully conceived and well written and the question propounded is intelligently discussed. The conclusions have none of the pessimism displayed in the consideration of the subject by Rosamund Essex in the same journal in August, 1969. To our mind, Mr. Butler presents the difficulties fairly, and his plea to parochial church councils and church organisations for their interest and support is pertinent and valuable. We were pleased to see in the following issue a letter from Rev. Roger Keeley, master of the Salisbury Diocesan Guild, amplifying Mr. Butler’s remarks and providing a useful counter to much loose thinking on this matter. If evidence were required to show that ringing is, on the whole, flourishing, we might speedily find it in the continued publication in local and national newspapers of the activities of learners, and particularly of young people. We have noted, among other references, the boy organist of ten years of age at Whepstead, who is also a bellringer, the young handbell ringers at South Wigston, the pupils of Newpark Boys’ School, the young learners at Walsall and the girls of the Minster Church at Warminster. 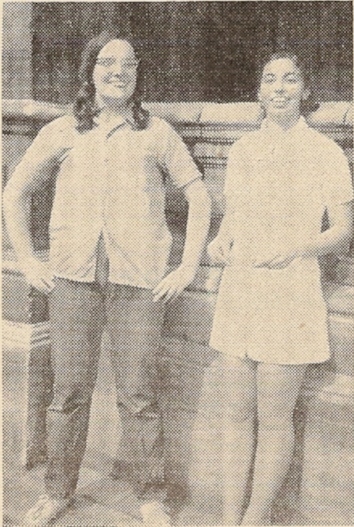 In Nottinghamshire The Evening Post and News portrayed the self-help activities of the young folk at Gotham and Bunney. The West Briton showed us Mr. Carveth and his learners at Truro and The Bucks Herald commented on the increased membership of the Oxford Diocesan Guild. The Western Times and Gazette showed us a picture of Mrs. Hobbs, probably the only lady captain of ringers in the West Country. The same paper gave great prominence to the ringing festivals at Dolton, while its companion paper, The Western Morning News, reported the ringing contest at Poughill. In The Yorkshire Times in March, Barry Edwards wrote of the young ringers at Market Weighton, winners of the Albert Sellars cup. A most interesting enterprise is reported from Scotland: The Dunoon Observer gave great prominence to the work by volunteers on the bells at Inveraray, the visit of Mr. Norman Chaddock with a party from Yorkshire and the public meeting that was convened to inaugurate a “Society of Friends of Inveraray Bells”. Among the larger scale articles we find two featuring bell foundries. The Leyland Journal in January dealt with the Loughborough Foundry, with special reference to carillons. The aerial view of the carillon console is unusual and very informative. The V-Belt Journal, September, 1970, reviewed the history of the Whitechapel Foundry, and the mixture of photographs and old engravings is most attractive. A long article in The Farmers Weekly, of March 27, is called “Easter Carillon”. J. L. Jones, a non-ringer, makes a reasonably good job of talking about change-ringing. In writing of tower captains he tells us that each one is “an expert in change-ringing”. In The Allbright Journal, Mr. Owen Ballard, of Cavendish, Suffolk, discussed change-ringing, and his own particular task, with reporter Mike West. A photostat copy of “The Tintinnabulation of Bells”, by Joan Melloan, came to us from The Paris Herald Tribune. The article opens with a tribute to Tom White, provides miscellaneous information on change-ringing and a note on Mr. Wilfrid Wilson! In ascribing to Wales the distinction of producing the latter gentleman is not the author having in mind another distinguished member of the Exercise, this time a Wilfred? We feel we should single out Mr. Bernard Grove’s essay, “The Bell Ringing Bit”, in Cover 53, the magazine for insurance brokers. It is well planned, has an entertaining coloured diagram and manages to convey essential information without involving the lay reader in a maze of technicalities. The Irish press usually provides some interesting notices of bells and bellringing. During October, “Sheridan”, writing in The Irish Independent, provided a lengthy appreciation of the bells of St. Patrick’s Cathedral, Dublin, and the romantic thoughts they aroused in him. The acquisition by the Old Dublin Society of the armoury bell from the Pidgeon House Fort, Dublin, was given a prominent place in The Evening Herald, and the same paper gave enthusiastic support to the appeal for funds to restore the tower and bells of St. Audeon’s Church, Dublin, which has two bells dated 1423, said to be the oldest bells in Ireland. From Canada comes a cutting from The Toronto Daily Star, with an account and photograph of Mr. Hillis Rowland. He collects bells of all kinds and now has more than 400. Far to the west of the Dominion, at Christ Church Cathedral, Victoria, B.C., the local press featured Mr. Edward Izard, master of the Cathedral Ringers. Now 81 years of age, Mr. Izard has been ringing for more than 60 years, and for 33 years he has rung regularly at Christ Church. The Victoria Daily Times interviewed him in December and paid tribute to him in an article accompanied by an excellent photograph. In New Zealand a similar tribute was paid in The Christchurch Star to the Sloan brothers, David, aged 66, and Nelson, aged 64. A leading article, accompanied by a very jolly photograph, outlined their ringing careers and wound up with presentations to them by the Bishop of Christchurch. The remoteness of some of these ringing bands, the distances that divide them from one another and the pluck and persistence with which they overcome the difficulties of time and space should provide for us in Britain much food for thought. From Australia we have had no news cuttings this year, but we know from The Ringing World how very much alive the Art is on the other side of the world. The Ringers’ Notebook and Diary. The Sentinel - the journal of the Ely Diocesan Association. We are very sorry to learn that this most attractive publication has ceased through lack of support. We shall miss its bright and informative work and its very charming covers. The Peterborough Guild News Letter. Church Bells of Wiltshire - reprint by Kingsmead Press. Tintinnalogia - facsimile reprint by Kingsmead Press. The Bells of Bale, by Paul Cattermole. About Bells and Bell Hanging, by R. H. Jones. Reverberations - journal of the Handbell Ringers of Great Britain. The publicity given to bells and bellringing by the Press during 1970 has shown quite clearly the maintenance and increase of ringing activity, both here and abroad, and has emphasised once again the devoted service of ringers, instructors and the very hard-working tower captains and ringing masters, whose lot is not always a happy one. We thank all those who have sent us material from which we have been able to compile this review and to pay some small tribute to those who have laboured to make our Art more widely known to the public. (a) New methods and performances on tower bells. Jan. 4 5056 Harpenden Surprise Major. A.S.C.Y. 10 5152 Raglan Surprise Major. A.S.C.Y. 11 5024 Aldgate Surprise Major. A.S.C.Y. 19 5024 Blenheim Surprise Major. Oxford D.G. 22 5088 Clifton Surprise Maximus. St. Martin’s G.
Feb. 2 5088 Newton Nottage Surprise Major. Llandaff and Monmouth D.A. 7 5056 Aynho Surprise Major. Peterborough D.G. 7 5056 Bradford Delight Major. Yorkshire A. 14 5056 Westmill Delight Major. Hertford C.A. 14 5184 Easingwold Surprise Major. Leeds Univ. Soc. 21 5024 Perry Barr Surprise Major. St. Martin’s G.
28 5056 Knotty Ash Delight Major. Lancashire A. 28 5056 Checkendon Surprise Major. Oxford D.G. 28 5280 Quex Surprise Maximus. St. Martin’s G.
Mar. 7 5120 Cheddar Surprise Major. Hertford C.A. 7 5040 Llandaff Surprise Royal. Llandaff and Monmouth D.A. 7 5056 Burghclere S. Major. Winchester and Portsmouth D.G. 30 5152 Accrington Surprise Major. Surrey A.
April 4 5088 Peterstone Wentloog S. Major. Llandaff and Monmouth D.A. 4 5088 Easter Surprise Major. Oxford D.G. 12 5088 Earls Barton Surprise Major. Peterborough D.G. 16 5024 Aldermary Surprise Major. Middlesex C.A. 21 5000 Oswald Delight Royal. Southwell D.G. 25 5088 Felixstowe Surprise Major. Hertford C.A. May 1 5024 Caerffili Surprise Major. Llandaff and Monmouth D.A. 2 5152 Nettleden Surprise Major. Peterborough D.G. 30 5088 Fulham Surprise Maximus. Leicester D.G. 30 5056 Kingsthorpe Surprise Major. Peterborough D.G. June 6 5184 Ilkley Surprise Major. Middlesex C.A. 16 5088 Umbala Surprise Major. Peterborough D.G. 16 5184 Morland Alliance Royal. Southwell D.G. 27 5376 Meldreth Surprise Major. Ely D.A. July 21 5120 Kettering Surprise Major. Bedfordshire A. 27 5040 Bushmead Surprise Royal. Bedfordshire A.
Aug. 1 5088 Stonehenge Surprise Major. Oxford D.G. 9 5120 Marshall Delight Major. Peterborough D.G. 15 5184 Launceston Surprise Major. Bristol S.
15 5184 Teston Surprise Major. Kent C.A. 31 5056 Aldwickbury Delight Major. Lancashire A.
Sept. 2 5088 Blaenafon Surprise Major. Llandaff and Monmouth D.A. 3 5024 Portishead Surprise Major. S.R.C.Y. 8 5024 Overstone Surprise Major. Peterborough D.G. 17 5024 Brystol Alliance Maximus. St. Martin’s G.
24 5056 Henbury Surprise Major. Sussex C.A. 26 5040 Belfast Surprise Maximus. Oxford D.G. 26 5088 Grafham Surprise Major. Peterborough D.G. Oct. 4 5040 St. Nicholas Bob Triples. Yorkshire A. 9 5024 Usk Surprise Major. Llandaff and Monmouth D.A. 11 5040 Horam Little Surprise Major. Kent C.A. 14 5120 Machen Surprise Major. Llandaff and Monmouth D.A. 15 5280 Glasgow Little Surprise Maximus. St. Martin’s G.
17 5184 Foxhall Surprise Major. Peterborough D.G. 24 5024 Versailles Surprise Major. Peterborough D.G. 31 5040 St. Michael’s Michael Surprise Royal. Winchester and Portsmouth D.G. Nov. 5 5088 Cheapside Surprise Major. Hertford C.A. 6 5024 Gwent Surprise Major. Llandaff and Monmouth D.A. 7 5088 Selhurst Surprise Major. Surrey A. 12 5000 Clyde Little Surprise Maximus. St. Martin’s G.
21 5056 Sonning Surprise Major. Gloucester and Bristol D.A. 28 5152 Wroxton Surprise Major. Oxford D.G. 21 5056 Bilsborrow Surprise Major. Univ. London Soc. Dec. 3 5088 Lennoxville Surprise Major. Oxford D.G. 12 5088 Banewella Surprise Major. Bath and Wells D.A. 12 5040 Findern Surprise Royal. Derby D.A. 12 5056 Leander Surprise Major. Oxford D.G. 12 5376 Downton Delight Major. Salisbury D.G. 17 5056 Axminster Surprise Major. Sussex C.A. 19 5376 Cold Christmas Delight Major. Hertford C.A. 19 5040 Ruxley Little Surprise Major. Kent C.A. 27 5184 Westhoughton Delight Major. Lancashire A.
Jan. 17 6048 Spliced 27 Surprise Major (all the work) Gloucester and Bristol D.A. Feb. 21 10080 Spliced 45 Surprise Major (all the work) Middlesex C.A. June 20 5040 Spliced 105 Surprise Maximus. Lancashire A. 27 5280 Spliced 110 Surprise Maximus. Lancashire A.
Sept. 19 5040 Spliced 75 Surprise Royal. Leicester D.G. Dec. 13 5040 Spliced 126 Surprise Royal. Gloucester and Bristol D.A. Sept. 19 9960 London III Surprise Royal. Peterborough D.G. Dec. 12 13440 Ashtead Surprise Major. Yorkshire A. (b) New methods and performances on handbells. Mar. 16 5040 Spliced 14 Surprise Maximus. Hertford C.A. Apr. 13 5096 Little Bob Fourteen. Hertford C.A. Apr. 21 5040 Spliced 16 Surprise Maximus. Hertford C.A. Oct. 13 5096 York Surprise Fourteen. Leicester D.G. Nov. 23 5040 Spliced 6 Surprise Fourteen. Hertford C.A. Dec. 11 11111 Stedman Cinques. Leicester D.G. The committee request the Council to make a decision regarding the peal of Surprise Maximus rung on January 21, 1970, which started as Kidderminster but had to be brought round by the conductor calling “Back bells ring Yorkshire”. The collection of compositions for 10- and 12-bell peals is now ready for the printers. Twelve months ago we wrote of 1969 as being a year of change. 1970 proved to be a year of difficulties and indeed we have now just had to deal with a still greater difficulty - the postal strike. However, with the help of our many staunch supporters, the hard work of our editor and the Guildford office staff and the support of officers of the Council, the committee were able during 1970 to meet and overcome the difficulties as they arose. The accounts for 1970 will be dealt with separately at the Council meeting, but we are glad to be able to report that the year showed a net income of £416. This in spite of a direct increase in printing costs from August 1 of £20 a week. It must be emphasised that this is not a normal “trading” income, but that on a strict trading basis our accounts would show a loss. For example, on the income side is shown almost £800 interest and premium on investments and on the expenditure side about £225 taxation on those investments. The “income” also includes the magnificent sum of over £1,000 in donations, for which we are very grateful. Charges were for 51 issues only in 1970. At the end of the year we were faced with a further increase in charges and, after negotiation, we reluctantly had to agree to an increase of 12½% in the basic charge by Seven Corners Press to operate from January 1, 1971. To meet this, and (for postal subscribers) increased postage rates due on February 15, 1971, we had to increase the price of the paper and the subscription rates and to make increases in charges for notices and advertisements. We have agreed that when the need arises we shall publish extra pages to make up in some measure for the increased charges. That to date the higher postage has not operated because of the post strike is a fortuitous gain to our finances, but this will be counterbalanced by the extra cost and labour involved in trying to distribute the postal copies by any and every means available to us. One result of using our investment income to pay our way is that we have been unable to increase our capital and whereas at one time the value of our investments was approximately equal to a year’s expenditure, now it is only about two-thirds of that proportion. We hope that an improvement in the economic situation and increased revenue will help us to remedy this position gradually. With our new system of accounting we were able to consider interim accounts when taking financial decisions at our meetings in July and November. As well as the two sets of negotiations over charges, we have had to cope with power cuts, making for production difficulties, and our editor also managed to avoid losing an issue at Christmas, despite the printers’ long break. We have also managed to have full issues, with coloured covers, throughout the whole year. As promised, we experimented at the end of the year with a Ringing World Calendar for 1971. Perhaps we were over-cautious - we ordered only 500 copies to start with, but we ultimately sold 1,200. The small profit will be useful, but more importantly we have now advertisements for The Ringing World in many towers. Our thanks to the editor and the office staff for undertaking all this extra work involved and to those who supported this venture. With this experience we intend to produce an even better article next Christmas. We have arranged, as last year, for a separate typed Index for 1970, and again have to thank Mr. H. L. Roper for undertaking its preparation. Members of the Council will recall and others will have read the result of the T. W. White testimonial, but for the sake of completeness we report that at the Central Council meeting in 1970 the president presented to Mr. White an inscribed piece of silver and a cheque for £600 in token of the appreciation of the Exercise for his 23 years as editor of The Ringing World. A presentation was also made to Mrs. White. We are glad to report that Mr. White is a regular visitor to the Guildford office. By the time this report appears we shall have celebrated the Diamond Jubilee of our journal. Towards the end of 1970 a great deal of our editor’s time and that of the Committee was concerned with appropriate arrangements to mark this event. Although it takes place in March, 1971, and will have been fully reported, it would be wrong to omit any reference to it in this report and lose the opportunity of thanking all those who are helping with the arrangements. While we welcome suitable correspondence for our pages, including, if desired, strongly-worded opinions, we wish to reiterate that we do not intend to print letters which are libellous or contain unpleasant personalities. Whatever the news we have had to tell, good or bad, we have continued our policy of telling our readers of the major work done at each of our three committee meetings during the year and of special articles about the financial facts leading to the price increases and our policy in regard to correspondence. Now we must thank all those who have helped in any way with our task of providing the Exercise with the best paper we can afford. To our editor, who has now successfully completed his first full year, and to Mr. and Mrs. Lucas at Guildford, who at times, including the present, have worked far harder than we have any right to expect; to the staff of Seven Corners Press Ltd., with whom our relations have continued excellent in spite of financial difficulties; to Messrs. A. K. P. Poole and J. Andrews for their work on the leading peal ringers list; to Mr. David Tate, our accountant, who produces figures whenever we ask for them and attended a committee meeting to help us; to the Council’s officers for their attendance and support at meetings, and to our regular and loyal supporters who continue to write for us, to buy our paper, and - so many of them - to send us voluntary donations which help us to maintain standards. Perhaps we may now also, while it is fresh in mind, thank all those who during the post strike in these early weeks of 1971 have visited Guildford regularly and helped in this and other ways to distribute throughout the country many hundreds of our postal copies. The convener wishes especially to thank all the members of the committee for their 100% attendance and support at meetings, and Mr. Denyer for his continued help in what at times has been daily contact to deal with problems as they arise. (Signed) WILFRID G. WILSON, Convener. 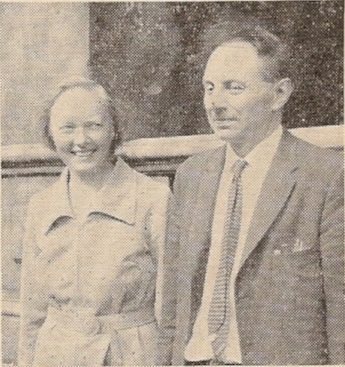 Mr. and Mrs. Cyril Wratten. Undoubtedly the item on the agenda which was looked upon by the members present as of primary importance was the election of a successor to Mr. Vernon Bottomley as secretary of the Central Council, and in view of Mr. Bottomley’s recent illness and consequent absence from the meeting at Leamington Spa over the Whitsun week-end, there was a possibility that, whoever was the successful candidate, would have to take over almost at the outset. However, Mr. E. A. Barnett, vice-president and a previous secretary, stood in for the whole of the day, ably assisted, as always, by his wife, Mrs. Olive Barnett. The three nominees were Mr. D. E. Sibson, Mr. B. Threlfall and Mr. C. A. Wratten, and, having been formally proposed and seconded (R.W., p. 439), the president announced that should no overall majority be obtained by any of the candidates, a second ballot would be held between the two with the highest number of votes. This, in fact, did happen, the tellers (Messrs. F. Sharpe and F. Perrens) giving the first result: Mr. Wratten 72, Mr. Sibson 51 and Mr. Threlfall 44. The second vote gave Mr. Wratten 91 and Mr. Sibson 74. The chairman, congratulating Mr. Wratten, invited him to join the officers on the platform, but before doing so Mr. Wratten expressed thanks to the Council members for electing him as their secretary. He would, he said, do his best to carry out the duties of his new office efficiently, a statement which was received with considerable applause. He then ascended the platform and was “initiated” into the preliminary duties of hon. secretary of the Council. The ringing programme during the weekend was very well organised and those who came early on Saturday were able to enjoy leisurely travelling - apart from the holiday traffic! Peals were arranged and several attempts were successfully accomplished. On Sunday all towers open were well used, indeed one car party rang for six services. Places of historic and local interest were visited, many of which were crowded because of the holiday and local festival events, but the unsettled weather on Sunday made the roads reasonably quiet. The headquarters (The Regent Hotel) certainly became more alive on Sunday evening as far as the bellringing fraternity were concerned, and the dulcet tones of well-known conductors were heard in many rooms - particularly those in which there was a bar. A discussion group met under the chairmanship of the president (Mr. John Freeman), supported by Mr. E. A. Barnett (vice-president) and was led by Mr. Brian Threlfall of the Towers and Belfries Committee, who first read a previously prepared paper, and much useful information was forthcoming. Later, smaller groups continued to debate the points brought out during the main discussion. Many of the older members of the Central Council of Church Bell Ringers remember meetings where feelings ran high and tempers became frayed during the business meeting, and tales are told each year of happenings in the past. The third session of the 27th Council which assembled in the Town Hall, Leamington Spa, on Whit Tuesday, 1971, will not, however, be remembered as one where pent-up emotions exploded. It was in many ways quite the reverse, but at intervals the sparkle and humour which are features of the majority of bellringers’ functions brought moments of relaxation and enjoyment. The opening, as is customary, was with prayer, led this year by Canon K. W. H. Felstead, and the president (Mr. John Freeman) then apologised for the absence of the retiring honorary secretary (Mr. Vernon Bottomley) and Mrs. Bottomley. Mr. Bottomley was taken ill some weeks ago but is now improving, and the good wishes of the Council were sent on the proposition of the president. Other apologies were received from Messrs. J. F. Smallwood, D. Hughes, H. L. Roper, J. T. Barrett, J. H. Bluff, N. Chaddock, J. D. Clarke, J. T. Dunwoody, J. H. Edwards, J. Hine, J. Fidler, A. Tapper, D. A. R. May, G. W. Pipe, C. A. Tester, E. F. Willcox, M. C. W. Sherwood, P. J. H. Wycherley and Dr. C. Johnson. One new member, Mr. A. Barber (Ely Guild) was welcomed. Mr. D. E. Sibson proposed that the report of the Joint Committee (not printed on the agenda) be taken after the other committee reports and this was seconded by Mr. F. T. Blagrove. The motion, when put to the meeting, was carried. Canon K. W. H. Felstead being the only dissenter. The following honorary members due to retire were re-elected: Mrs. Olive Barnett (proposer W. F. Moreton), Sir John Betjeman (F. E. Dukes), C. K. Lewis (Canon Felstead), F. E. Collins (R. Savory), B. Austin (R. F. B. Speed), W. Osborn (F. E. Dukes) and J. R. Mayne (D. E. Sibson). Mrs. Jeanne Bottomley resigned and Mr. H. L. Roper did not seek re-election. The president asked that the appreciation of the Council be placed on record of all the work done by Mr. Roper on the Analysis Committee and in preparing the index for The Ringing World. This was agreed unanimously. Mr. S. T. Price, who represented the Gloucester and Bristol Association 1948-50, attended three meetings (died December 16, 1970); Mr. J. E. Lewis Cockey, Middlesex Association, 1939-48, attended five meetings (February 25, 1971); and Mr. G. W. Fletcher, Middlesex Association, 1930-47; honorary member 1948-50; life member 1951-71; hon. secretary of the Council 1931-52; attended 28 meetings (died May 23, 1971). Prayers for the departed were given by the Rev. John Scott whilst the meeting stood in silence. The president then spoke of the work of Mr. Fletcher as an administrator and said he was a real power in the Council. A great deal was also owed to him for his work in connection with The Ringing World, for he was one of the small band who took over the responsibility for it on the death of the first editor and proprietor, Mr. J. S. Goldsmith. The meeting concurred. The minutes of the Council’s meeting at Ilkley, Yorks, in 1970 were approved, and signed by the chairman, on the proposition of Mr. E. A. Barnett, seconded by Mr. W. Ayre. There were no matters arising. The report of the honorary secretary was proposed for adoption, in the absence of Mr. Bottomley, by Mr. E. A. Barnett (acting hon. secretary) and being seconded by Mr. Dukes was carried. The hon. 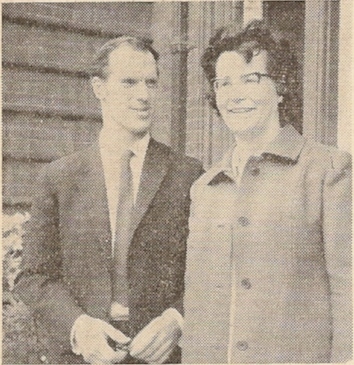 general secretary of the Coventry Diocesan Guild (Mr. H. M. Windsor) with Mrs. Windsor. At this stage Mr. Freeman paid tribute to the work of Mr. Bottomley during the past five years, who because of his business commitments had found it impossible to continue in office as secretary. Mr. Bottomley had had an operation before Christmas and recently had contracted an infectious jaundice, but (as he had already stated) was now greatly improved in health. It was agreed that Mr. Freeman write on behalf of the Council to Vernon and Jeanne Bottomley expressing appreciation of their work. As the librarian (Mr. Sharpe) was adjudicating on the election of hon. secretary, the Library Report was not taken at this stage. The report of the trustees of the Carter Ringing Machine was accepted on the proposition of Mr. F. Haynes, seconded by Mr. W. Dobbie, it being stated that in the near future a charge for visiting parties would be made because of the fee to public museums. However, if ringers could be considered as students they would be admitted at half price. The Council adjourned for the lunch break, served in the Urquhart Hall and, on resuming, the revised rules were gone through separately, first having been proposed by the president and seconded (in writing) by Mr. Bottomley. Mr. Freeman proposed and Mr. Barnett (for Mr. Bottomley) seconded the motion to increase the annual subscription (from January 1, 1972) to £1 per representative. It was stated that the last increase was from 5s. to 10s. (in 1953) and following a question by Mr. G. Halls on the basis for £1, Mr. D. Beresford gave the explanation that this was in order to have the general fund standing in its own right (it is now subsidised from the publications) and to help pay The Ringing World for printing minutes, etc., also for the expenditure of meetings. This was estimated at £1.75 per member. Mr. Halls asked how the difference was to be made up and Mr. Barnett replied that even if the increase did not cover the amount required, the general fund was showing a profit. It did not matter in which account the profit showed. It was merely a book-keeping transaction. The proposition was then carried. 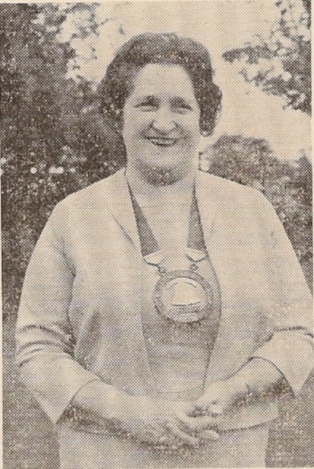 Mrs. D. E. Beamish, president of the Coventry Diocesan Guild. The appointment of a Publications Committee resulted in the following agreeing to serve: Mr. G. Drew (proposed by Mr. Moreton), Mr. W. G. Wilson (Mr. R. F. B. Speed), Mr. E. C. Shepherd (Mr. F. Dukes), Mr. Sharpe (Mr. Roe) and Mr. W. F. Moreton (Mr. Butler). The committee reports were submitted and adopted as follows: (a) Biographies, (b) Education, (c) Methods, (d) Overseas, (e) Peal Analysis, (f) Peals Collection, (g) Records, (h) The Ringing World, (i) Towers and Belfries, (j) Literature and Press, (k) Broadcasting and Television, (l) Joint Committee. Details of the provisional arrangements for the Council’s meeting in London in 1972 were given by Air Commodore J. S. Mason and Mr. D. E. Sibson but, following an inquiry by the president for the place for the Council to meet in 1973, no invitations were forthcoming. The matter was not therefore pursued at this stage. The president was congratulated by the Rev. J. Scott on his handling of the meeting and Mr. Freeman was applauded by those present. Sincere thanks were voiced by the president to the Coventry Diocesan Guild, particularly to Mr. H. Windsor (general secretary), to the incumbents for the use of the bells and to the Bishop of Coventry and the Mayor and Corporation of Leamington Spa. Mrs. Beamish (Coventry Guild president) spoke briefly and said she would convey the thanks to the committee who had helped in the organisation. Mr. W. G. Wilson asked that special thanks be accorded to Mr. and Mrs. E. A. Barnett for stepping in at short notice to deal with the secretary’s duties, and this was agreed with acclamation. The president then declared the meeting closed. Many of the Council members in the Leamington Spa area for the meeting attended one or more of the services for which they rang on Whit Sunday, and the local ringers and the clergy made the visitors very welcome. The usual service of Holy Communion was held at All Saints’ Parish Church, Leamington at 7.30 a.m., before the business meeting on the Tuesday, and there was a very good attendance. The Bishop of Coventry was the celebrant, assisted by the vicar and other clergy, and the beauty of the lovely church in the morning, sunshine and the sense of brotherhood among the bellringers joining together in this simple act of worship enhanced the feeling of peace and goodwill which helped towards a better understanding and tolerance during the important business later in the day. Before the service a well-struck touch of Stedman Triples was rung, and in the evening further ringing also took place. Mr. T. J. Lock (right) (Middlesex C.A.) 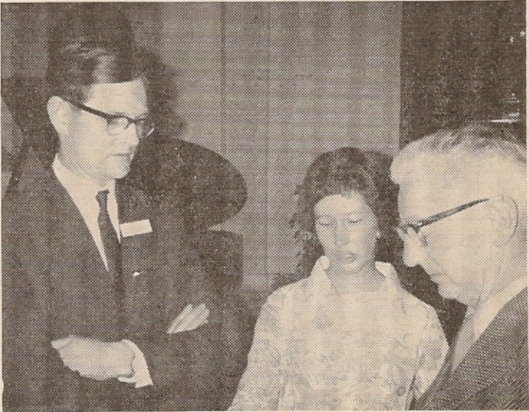 in conversation with Mr. R. Winter (ringing master of the Coventry Guild) and Mrs. Winter. The Committee have reluctantly decided that, due to unforeseen circumstances beyond its control, an accurate Report for 1970 cannot be produced. This is almost entirely due to the recent prolonged British postal strike and its overseas ramifications which have debarred detailed and up-to-date news of ringing activities from our correspondents overseas reaching the Committee. It would, however, have been possible to collate hitherto published information in The Ringing World, but we consider that such a Report would have made no useful contribution to the ringing fraternity. The prime function of this Committee, at its inception, was to promote, encourage and co-ordinate campanology outside the British Isles. It is considered that, in at least some measure, it has, over the years, been successful - especially if one considers the achievements of ANZAB and The North American Guild, encouraged by the multifarious visits of ringers throughout the world. As the deliberations of the next Central Council Meeting may result in the demise of this Committee in its present Structure and workings, as being recommended by the Standing Committee, we would extend to all our overseas ringing brethren and connections our very best wishes for their continued success in their endeavours and look forward to reading of them in the columns of the truly international medium - The Ringing World. From all parts of the British Isles during the Whitsun week-end representatives of affiliated guilds, societies and associations travelled to the centre of England to meet at Royal Leamington Spa for the third session of the 27th Council, and on Whit Monday evening received there a tremendous welcome from the civic and religious bodies in addition to that of the Coventry Diocesan Guild of Church Bell Ringers. The Pump Room was packed when the president of the Council escorted the Mayor and Mayoress of Leamington Spa (Councillor S. W. T. Birch and Mrs. Birch) and the Lord Bishop of Coventry (Rt. Rev. Cuthbert K. N. Bardsley) to the table at the head of the room, where also were seated the vicar of All Saints’, Leamington (the Rev. Idwal Jones) and Mrs. Jones, the president of the Coventry Guild (Mrs. D. E. Beamish) and the guild’s general secretary (Mr. H. Windsor) and Mrs. Windsor. Mr. Freeman opened the proceedings by expressing appreciation, on behalf of the Central Council, to the Mayor for permitting the use of the Royal Pump Room for the meeting that evening. It was a pleasure always to meet in a pleasant town, and this year it was especially agreeable to visit the beautiful town of Leamington Spa. Addressing the Lord Bishop of Coventry, Mr. Freeman said: “I wish to thank you, my Lord Bishop, for your part in the proceedings, and also the clergy of your Diocese who have permitted ringing during the week-end. It has been possible to ring at about 60 towers during the last few days.” He was, he added, glad that both the Church and the State were represented that evening, for it was felt that on State occasions the church bellringer had been able to express the sentiments of the populace at large. Finally, he thanked the Coventry Guild for their tremendous organisation and hard work put in to ensure a successful weekend for the Council. He had had experience in organising events for the Central Council in the past, and all would applaud the efforts of the president of the Coventry Guild and her committee. It was a great pleasure to be there that evening, and he thanked everyone most sincerely for their hard work. Mr. Freeman then called on the Mayor of Leamington to address the gathering. Saying he felt rather like an actor following a good act (it was jolly difficult! ), the Mayor said it certainly would not be easy to follow the previous speaker. The Bishop welcomed the great concourse of ringers to his Diocese and particularly mentioned the many present who were under 30 - a very encouraging sign. He felt that bellringers played an important part in the life of the country. As the most travelled man in the room, he said it was a great joy to know that we still had the best bells in the world. 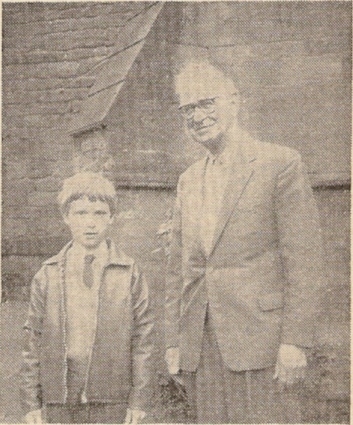 The youngest and the oldest ringers at Allesley Church, Warwick: 10-years-old Stephen Selpham and 79-years-old Frank W. Perrens. Bells are a great part - or should be - of the mission of the Church. We live in an intensely materialistic age, and what was needed today was a renewal of our faith in which the bells of our churches can play a very vital part. Bells reminded men of life after death. Remember God and life eternal was the message that they pealed forth, reminding men that we all need the Church. The Church was invincible and I hope you will all go away from this conference feeling, as he certainly did, that all was not lost in the Church today. It was the darkness before the dawn, and he believed that in the years ahead fresh enthusiasm would spring forth and the Church, with the help of its bells and bellringers, would go forward to new life and encouragement. May God bless you all, concluded the Bishop amidst applause. Mrs. Beamish, addressing the gathering on behalf of the Coventry Diocesan Guild, did so with great sincerity and simplicity. She said: “We are very happy to welcome you to Warwickshire; 37 years having elapsed since the last visit of the Council. Mr. Cyril Burt, captain of the local tower, had been most helpful in making arrangements at the church and hall, and together with the other incumbents and ringers at churches where ringing had taken place. Mrs. Beamish expressed her gratitude. 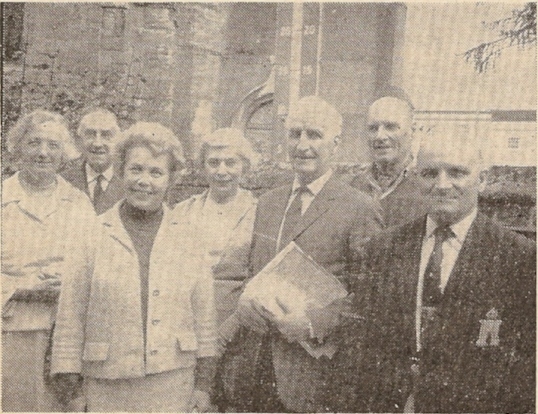 Some of those who went on the coach tour on Whit Monday: (l.-r.) Mrs. W. Oatway, Mr. S. T. Hanley, Mrs. B. E. Bartlett, Mrs. N. Bagworth, Mr. B. E. Bartlett, Mr. R. Wettenhall and Mr. K. Arthur. “We hope that tomorrow’s business meeting will prove to be a satisfactory one and that you will return to your towers with many happy memories of the 1971 meeting,” said Mrs. Beamish. “I should like to take this opportunity of thanking the civic authorities for their generosity and co-operation in the planning of this week’s events. The Town Hall and these Pump Rooms have been placed at our disposal entirely free of charge. “We are delighted,” she continued, “to have our well-loved Bishop present. As patron of the guild he takes the greatest interest in our affairs and attends our functions as far as his engagements permit. At the conclusion of the formal proceedings light refreshments were served, and the bar was well patronised. Piano music was provided and handbell tune-ringing was enjoyed by those not too engrossed in that part of the room where the liquid refreshment was dispensed. A happy and convivial time was spent by all and little anxiety appeared to be shown for the next day’s important business matters. There is little doubt, however, that the holding of the official welcome proceedings on the eve of the conference is not only a saving of time but a release from tension and a build-up of goodwill and understanding between the members. The Regent Hotel was opened in August, 1819, and is the first hotel of any consequence to have attained its 150th anniversary. It was founded by John Williams, former butler to the Greatheed family, at Guy’s Cliff, near Warwick, and was known as Williams Hotel for a few weeks until the Prince Regent, Prince of Wales, on a visit, granted permission for it to be renamed “The Regent” and to carry his arms and crest “Ich Dien.” It was then the largest hotel in Europe, but Leamington’s population was under 2,000. During the Second World War the hotel was requisitioned and most of the camouflage scheme at home and abroad were designed in it. Enemy raiders flying to Coventry on the night of November 14, 1940, demolished with bombs the archway and clocktower that stood at the entrance to the Regent Garage, also smashing the stained glass windows which lit the hotel’s staircase. The present windows are now acknowledged to be some of the finest modern work in the country. As stated in our general account on pages 523/4 of the issue of June 18 of the proceedings of the Council’s deliberations at Leamington Spa on Whit Tuesday the final report of the Standing Committee on the constitution and procedural working of the Council was taken item by item. This report was printed on pages 385/6 of The Ringing World of April 30, 1971, and at the outset the president reminded the members that this was really a consolidated report which took into account comments made on the reports of the three sub-committees presented to the Council at Ilkley last year, and he asked them to bear this in mind during the discussion. A number of amendments were, however, proposed. Mr. F. T. Blagrove and Mr. A. V. Davis felt that the Council’s first object should be “To promote the ringing of church bells as a witness to Christ” rather than “To promote and foster the ringing of bells for Christian worship and on other appropriate occasions”. Messrs. D. Beresford and J. R. Mayne thought it would be better not to lay down that honorary membership should normally be confined to those required to carry out a specific task, since this might result in the rejection of people whose presence was of value in its own right. But the Council, on a vote, preferred the original wording of the first object and considered that the wording “normally” was an adequate safeguard for special cases like Sir John Betjeman. The Rev. John Scott and Mr. R. S. Anderson wanted to reword slightly the provision for officers to become ex-officio members of the Council if they weren’t members already - not that they objected to the principle, but they felt the wording was not quite right - but again the Council would not agree. Mr. Edgar Shepherd and Mr. P. A. Corby had better luck in revising the terms of reference of the proposed new Public Relations Committee, Mr. Shepherd disliking that useful military word “liaise,” which he felt had somewhat sinister implications. So the committee will now be charged “To maintain contact with the Press and broadcasting organisations with a view to presenting to the public a correct image of bellringers and their work,” and to keep in touch with ringers overseas by the appointment of one of its members as Overseas Liaison Officer. The Towers and Belfries Committee, in the persons of Messrs. Alan Frost and Fred Collins, wanted to delete the proposal that committees other than the Administrative Committee, should normally consist of not more than five elected members, but when it was pointed out that another useful word, “normally,” would take care of exceptional cases their amendment was lost. Messrs. N. J. Diserens and N. V. Harding had better fortune in seeking to allow committees to co-opt members. The acting secretary, supported by the Rev. Roger Keeley, pointed out that a committee could always ask someone to assist them until he could be added to their ranks at the next Council meeting, but the members were not to be persuaded and decided by 65 votes to 48 that “A committee shall have power to co-opt not more than two members of the Council.” With that, the report was adopted, and to put into effect a recommendation in it that an ad hoc committee should be set up to investigate possible alternative arrangements for the library, should the need arise, Canon Felstead and Mr. Nolan Golden nominated the officers, with Messrs. Sibson and Ian Oram sensibly wanting to add Mr. Clive Smith to take care of the sound recordings aspect. To all of this the Council agreed. The members then turned to the proposed new rules arising from the report. It was not long before they got into rather deep water. Mr. J. E. Camp, supported by Mr. R. B. Smith, sought to reword Rule 5 (i) b slightly to “Those societies which hereafter become affiliated which are classified as non-territorial shall be entitled to one member per society.” Whereupon Mr. R. F. B. Speed maintained that, under the existing rules, notice should have been given of proposed alterations to the intended new rules, which, therefore, had to be either accepted or rejected as they stood. Mr. Cartwright, as the Council’s legal adviser, supported this view, whereat Mr. Camp, as a practising member of the Bar, promptly disagreed with it, as did the acting secretary, who said there were ample precedents for such goings-on. After various members had added fuel to the flames the president ruled in favour of the original objections and the Council proceeded in slightly stunned silence until it became apparent that, having amended the terms of reference of the Public Relations Committee when discussing the report it could not now amend the identical rule! Eventually the day was saved by Messrs. D. R. Carlisle and W. F. Moreton’s motion that the meeting should accept drafting amendments which did not change substantially the meaning of the new rules. After some discussion on how substantial was substantial, the Rev. John Scott wondered if the insertion of a direct negative would be in order - the Council thankfully carried the motion, after which a number of other amendments were agreed. Messrs. Camp and Scott persuaded the meeting that, under Rule 10 (i), if one of the officers resigned in mid-session there was a danger that the members collectively might find themselves filling the vacancy, so now in such an event, “… the ensuing meeting shall elect a member to fill the vacancy”. Mr. Chris Rogers and Mr. Corby secured for conveners the right to render their reports by three months before the Council meeting rather than by February 28 as the new Rule 12 (v) proposed. Rule 12 (viii), regarding the Public Relations Committee, was duly amended on the motion of the president, seconded by Mr. C. K. Lewis, and everyone agreed with Mrs. Staniforth that the rules should not talk about “The Ringing World” in some places and “Ringing World” in others. It was decided that, because it would involve a “substantial” change, the amendment of Rule 12 (iv) to provide for co-opting members to committees should be left until 1972, and after Mr. Brian Threlfall had pointed out that notice of the amendment had to be given under Rule 15, not Rule 17, as printed, the Council’s scrutiny ended. The adoption of the new rules was moved by the president and acting secretary, but the question was then raised whether they would come into effect straight away, and if so whether it would be necessary for the meeting to elect all the new committees there and then, only to go through the same routine again next year at the start of the new Council. Mr. Cartwright’s opinion was affirmative, but the day was saved by Messrs. Sibson and Diserens, whose amendment to Item 10 of the agenda, to add the words “such rules to come into effect at the commencement of the next triennial session” was carried nem con, as was the substantive motion. The meeting then passed on thankfully to the next business. “That the Council should accept their own rules and regulations and be honest with themselves” was a comment by Mr. Walter Ayre when he presented the Peals Analysis report at the Central Council meeting at Leamington Spa on Whit Tuesday. The debate which followed was at times bitter, forceful and exacting, and we suggest left no doubt in the minds of the members that the standard of peal ringing is falling and that careful attention is necessary to prevent any further deterioration. Before the submission of the analysis report, however, and following the acceptance of the rules and the agreement that they should operate from January 1, 1972, the question of appointing a Publications Committee (item 12) was discussed and it was suggested it be left until the next session. Mr. W. F. Moreton, however, stated that, under the existing rules, there was nothing to stop the Council appointing a committee, which he felt should be done. The chairman (Mr. John Freeman, president): I think Mr. Bottomley put it on the agenda thinking that the new rules would come into force immediately. Mr. Moreton then proposed that item 12 should be taken. Mr. W. G. Wilson seconded and added that next year it would be necessary to elect members to all the committees and to have got this one started this year would give some satisfaction. The proposition was carried and the committee was appointed (R.W., page 524). Mrs. Staniforth: Will this committee now be re-elected in three years? Would it not be better to appoint the members for four years and to come in line with the other committees? The chairman: The committee will serve for one year and will be reappointed next session for a period of three years. Biographies Committee.- Adoption proposed by Mr. T. J. Lock, seconded by Mr. W. H. Viggers and agreed without discussion. Education Committee.- Mr. Moreton, proposing the adoption, drew attention to the two final paragraphs regarding theological colleges and the work of the Rev. R. D. St. John Smith in this connection. He proposed the Rev. St. J. Smith join the committee. Mr. W. Butler seconded both propositions, which were carried. Methods Committee.- Mr. C. K. Lewis stated that there was no formal report, although work had gone on during the year. Mr. Blagrove agreed with Mr. Lewis’s comment and the Council concurred. Overseas Committee.- Mr. P. Gray apologised for a poor report (which was to be the last, he said) and which had not been circulated. There had been several complications: the postal strike, the indisposition of Mr. G. W. Pipe and the illness of Mr. F. C. Price’s father, whilst he (the speaker) was in the process of moving to another area. Mr. Price had sent a report which he (Mr. Gray) would read (R.W., page 533). He formally proposed the adoption of the report, which Mr. Seager seconded. It was pointed out that this was not necessarily the final report, as now that the new rules would not operate until next year, it meant that another report could be given then. Those members who perhaps had allowed their thoughts to wander during the routine and somewhat commonplace dealings with the earlier reports sat up and took notice when Mr. Walter Ayre rose and stated that the report in the hands of the members was not by the committee. He had sent the book to Canon Felstead early in April and had received no communication or comments from him; the book had not been returned, neither had Mr. Roper seen the book. He (Mr. Ayre) was so disgusted by the reception of last year’s report that he had said he would not continue as convener, but as the other members of the committee would not take it he had had to continue. “I have had to bear the burden of the complaints; I have had insulting letters, requests for ‘whys and whats’ and corrections to mistakes and which I have corrected with the associations concerned,” went on Mr. Ayre. Mr. Roper having retired, and Canon Felstead not co-operating, it left only Mr. Lufkin to carry on. He could not allow that. He would therefore do the job and put up with the nonsense which he had to record year by year until he was chucked out or re-elected by next year’s Council. Mr. Ayre said that he had had great pleasure since 1948 being on the committee. It had been his life and he did not see why it should be destroyed. The Council should accept their own rules and regulations. They should be honest with themselves. When he picked up his Ringing World each week there were certain peals which stood out and which, in his opinion, should never have been published. Many of them, he felt, were not fit to listen to and this fact was known by many others but who did not have the courage to say so. “You have heard enough of me,” he said, “you have seen my report: I propose the adoption of this so-called report. Somebody said it was a questionnaire not a report, and last night I was told that I was as twisted as the stick I carry about! What about that?” concluded Mr. Ayre as he sat down. Mr. Lufkin seconded the report. Canon Felstead said he could not see how it was possible to second a report in which it said the figures and opinions will differ and disagree with that of the convener. Having been challenged, he felt he must explain. There was no point in forwarding the book in which Mr. Ayre kept the analysis (very thoroughly, too, for that matter) for checking. What was the point in checking the book when the report had already gone in? He had kept, it and handed it to Mr. Ayre that morning. The peal of Caters at Basingstoke? Mr. Ayre had stated that nobody was going to make him alter his mind. The committee were surely the servants of the Council and it was up to them to accept the decisions made by the Council. Twenty-five years ago the Council had turned down his (the speaker’s) request to accept a similar peal at Basingstoke. But the Council could change its mind and had done so. He regretted many of the things that had been said and that had happened. It was so very sad that Mr. Ayre, after a lifetime of service, had become embittered. We all had to accept the rough with the smooth. Although Mr. Ayre had inferred that he (Canon Felstead) would not remain a member of the committee, he was still a member. If he did not continue on the Council it would be a different matter. It had been a happy committee. If he (Canon Felstead) was the cause of the bitterness, he apologised. He was very sorry for any unhappiness that had crept it. Mr. Savory spoke about the three peals at Basingstoke: (1) The Grandsire Caters in which he took part was rung to enable local ringers to accomplish a peal in their own tower. It was a good composition suitable for nine bells and a similar peal had been accepted last year. It was well struck and worth listening to. (2) He could not, however, condone the ringing of the peal of Plain Bob Triples with two covers. This he felt was a stunt. (3) The Plain Bob Caters he knew little about. Mr. Savory asked that the Grandsire Caters, at least, be accepted. Mr. G. E. Pipe suggested that everyone should contribute towards another bell to complete the ten, or the question of 9-bell peals would arise every year. The points stated by Mr. Ayre raised the question of standards and the Council’s position, said Mr. W. T. Cook. Some seemed to regard it as occasions for stunts, or cocking a snook at the Council. The band who rang two simultaneous peals of Doubles at Leeds was the sort of thing to object to, said Mr. Diserens, whilst Mr. G. Dodds asked that conductors who discovered mistakes in peals recorded should deal with the matter and not wait for Mr. Ayre to draw attention to them. Mr. Gray associated himself with a remark by Mr. Diserens that it was a valuable report. He was, he said, puzzled by a remark by Canon Felstead earlier in the day that the committee might go out of being. This could not be so as it was part of the “aims and objects” which had been accepted by the Council in its constitution. There was a point which came out of this report which was significant and important. There were, according to the figures, 300 fewer tower bell peals rung in 1970 than in 1969, and if the steam was going out of peal ringing it was a serious matter. Speaking of Mr. Ayre’s qualities and of his hard work in connection with the Analysis, Mr. Lufkin said it was not right that one man alone should keep the records and he had tried to keep his own record from the R.W. He had not been able to check his figures as he had not received Mr. Ayre’s records book. He was very glad that Mr. Ayre would continue in office for another year and he hoped there would be a volunteer to keep another book of records to give, when studied, a more accurate check on peals rung. Several queries were raised and answered before Mr. Ayre rose and apologised for his previous outburst. The committee had never tried to tell the Exercise what they should or should not ring. All they asked was that they abide by the rules and decisions of the Council. Some of the things being composed today were thought of 60 years ago and turned down as being unworthy. Some of the names given to the methods, he felt, were very near the borderline and he asked conductors to take careful thought in the choice of names for new compositions rung. Three points were raised by Mr. C. Crosthwaite, who said (1) the Council must decide on the three 9-bell peals at Basingstoke; (2) the queries in the peals had to be answered, and (3) there was doubt about the accuracy of the figures supplied as the committee members did not seem to agree about them. Perhaps the report could be resubmitted next year when all the questions had been answered. After several similar comments had been made by members, Mr. Savory proposed and Canon Felstead seconded that the first peal of Caters (Grandsire) be accepted on the grounds of merit. Mr. Dawson suggested that it would be impossible for Basingstoke to ring anything but 9-bell peals and he moved that both peals of Caters be accepted but not the Triples: Mr. Crosthwaite seconded. When the vote was taken 65 were for and 55 against the first peal (Grandsire Caters) being accepted, whilst for the inclusion of the Plain Bob Caters the voting was 45 for and 73 against. Mr. Crosthwaite said it was a ludicrous situation [Hear, Hear!]. “We are trying to judge between two peals which most of us certainly did not hear,” he said. “All we know is that two peals of Caters were rung. For the life of me I don’t see why we cannot accept both peals” [Hear, hear!]. Mr. Corby added that having demonstrated their great virtues as arbitrators he hoped the Council would also discontinue accepting peals rung on the front eight of a ring of 12. On the proposition of Mr. Seagar, seconded by Mr. Gray, it was decided to reject the peal of Triples with two covers. Mr. Blagrove, supported by Mr. G. Dodds, suggested that Mr. Christopher Rogers be elected to the committee, and this was agreed. Mr. Lewis proposed and Mr. Mayne seconded that the Cambridge Minor with 2880s rung on November 5 be deleted from the records, and Mr. Jelley asked about other similar peals. It was pointed out that the dates of these were not known. The chairman asked if the Council would accept the report with the remaining queries being referred to again next year. Mr. Anderson moved this motion which Mr. Jelley seconded. Mr. Beresford queried whether Mr. Ayre’s resignation from the committee was being accepted or that his withdrawal later was to be agreed. The chairman said that the report would be accepted subject to deletion of any such reference to Mr. Ayre’s resignation, and the members agreed to this. Mr. Johnson stated that the reason for the removal of Cleveland from the records was that Cleveland was no longer in being. The Council then sat back to await the reports from the other committees. Owing to the postal strike, no Ringing Worlds for several weeks and other circumstances which will become clear later, this report has been forwarded to the secretary of the Council before the other members of the committee have had the opportunity to check, comment or disagree with what is here stated. Most probably their figures will disagree, as will also their opinions; therefore, in this case, it must be accepted as an individual report from the convener, who will accept full responsibility for what is stated. A copy of this will, of course, be sent to each member of the committee at the same time as this is forwarded to the secretary. As far as can be stated, the peals rung during 1970 were down by 300 on tower bells - 3,159 against 3,459, but up 153 on handbells - 501 against 348. Although the so-called peal of Caters at Basingstoke was accepted by the Council last year, the president did state emphatically that it should not be taken as a precedent. Let us see what has been done - this year the Winchester and Portsmouth - are asking us to accept three peals rung there, viz. : Grandsire Caters, Plain Bob Triples (with two covers) and Plain Bob Caters. These the convener has failed to include. Again the Yorkshire Association has headed the table, but it should be particularly noted how the Suffolk Guild has silently crept into 2nd place, without being in the first nine for years - back again where it should be. The following table shows the leading associations, etc. These nine rang 43.25% of the total peals rung. As far as known, there were 514 first pealers - a drop of 41, with 75 first as conductor - a loss of eight. ANZAB.- One method of Minor in N. Zealand, with five firsts. Gloucester and Bristol.- Doubles: First peal by all, also four firsts, with two first inside and first as conductor. 12 method Minor by the Taylor family. Lincoln G.- 154 and 142 m/v Doubles. Middlesex C.- 10,080 Spliced Surprise Major in 45 methods. Suffolk G.- Two method Doubles - first by all including the conductor; a new Sunday service band (good show). Yorkshire A.- 13,440 Ashtead Surprise Major. Hertford.- Six method Spliced Surprise 14. Little Bob 14, 16, 14, 12, 10 meth. Spliced Surprise Maximus. Leicester D.G.- York Surprise 14 and 11,111 Stedman Cinques. Oxford D.G.- Kent T.B. 16. British Railways, Cleveland and North Yorks, Devonshire A., East Derby and West Nottingham, National Police G., Sheffield and Dist., S. Derby and N. Leicester, and the going out of existence of the Dudley and Dist. We note with some regrets the amalgamation of the Leeds and Dist. with the Yorks A., which went out in a blaze of glory - the former, not the latter. (a) Why are many composers left out of peal reports? (b) Do peal reporters check what they have sent in? If so, why are there so many errors, many of which are never corrected, and the much-needed information as to what was rung, when and how, not supplied; e.g., Spliced Minor is not explained as instructed by the Council. Anc. Soc. College Youths and St. Martin’s G.: Bristol Max. 5086. Coventry G.- 5088 Kent Royal. Essex A.- 5121 Double Norwich Major. Guildford D.G.- 5140 Spl. Surp. R.
Middlesex C.- Pl. Bob at Windsor - 2/2028s; where are the other 1,000? Univ. Manchester.- Pl. Bob Major (5000). Hertford C.- 5248 Oxford T.B. Max. Kent C.- Sittingbourne, 14/2/70 What was rung? Oxford D.G.- 5266 P.B. Major. How did it start and when did it come round? Southwell D.G.- All Fool’s Delight - surely, very bad taste! Ditto. page 899.- Was the peal of Minor in five methods rung as stated? If so, surely we cannot accept it, finishing with 360 St. Clements. North American G., page 83: P.B. Major - no explanation how. I quite expect more insulting letters at my presumption in asking these questions, but is it not time that the warring element be checked? This is the last time I shall annoy you as I shall cease to be a member of this committee at the end of the Leamington meeting. Do not think I am presuming to tell people what they shall ring, but I think this is my job, what I have said, also an answer to G. W. Pipe’s criticism of the work, or lack of it, of this committee. Cornwall was well represented on the C.C. coach tour on Whit Monday and as usual delighted everyone with their talented ringing - and singing! Two of the many young ringers who helped prepare and serve lunch and cups of tea on Whit Tuesday when the Central Council visited Leamington Spa. The Peals Collection Report was short and factual and accepted with only a passing comment by the president, and this was followed by the Records Committee Report, the adoption of which was proposed by Mr. F. Blagrove. He said he took note of the corrections on page 466 of The Ringing World, and the addition (on November 12) of a peal of Shoreditch Delight Royal rung by the Cumberland Youths. He also stated the committee would like the Council’s decision on the peal of Kidderminster Surprise Maximus where three courses from the end a member of the band advised the conductor that the composition would not come round. He told the conductor to call a “single,” and for the back five bells to ring Yorkshire by which “rounds” were obtained. Mr. Sibson, seconding the adoption of the report, said it was quite ridiculous that if a conductor did not check a composition to see that it came round before starting a peal the conductor should be permitted to fiddle it at the end, and the committee were unanimous in considering that this peal be not allowed. He formally proposed that it be not included. Mr. G. Dodds seconded the proposition, which was carried. Mr. Jelley referred to a peal of Bristol Alliance Maximus on September 17 and Mr. Blagrove explained that on page 466 of The Ringing World the name had been corrected to Brystol. The report was adopted with three against. Mr. Mayne suggested that as the Peals Analysis Report had not been adopted the Kidderminster Surprise Maximus peal be not included in the Peals Analysis Report. The adoption of the Peals Collection Committee was agreed on the proposition of Mr. W. E. Critchley, seconded by Mr. Seager, the former requesting the new Publications Committee quickly to elect a convener and to advise those as to who would be acting in that capacity. Before moving the adoption of The Ringing World Report, Mr. W. G. Wilson (convener) referred to the death of Mr. George Fletcher, who was one of the four who served the paper with distinction in 1942, and all ringers had profited by that action. It was gratifying to the committee that Mr. Fletcher had been invited to the Diamond Jubilee celebrations, and although he declined had sent best wishes. 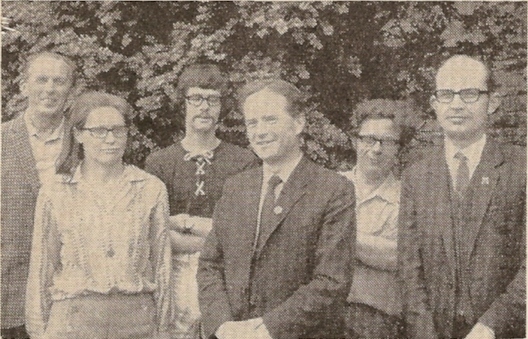 A photograph of Mr. Fletcher in the centre of a group had appeared in the Diamond Jubilee issue, and he felt sure that Mr. Fletcher had appreciated it. Mr. Wilson referred to the year of difficulties - with power cuts and strikes - which had been overcome but in spite of problems inherent through a change of editors there had been some progress. The Diamond Jubilee was an historic occasion and all were proud to have taken part, although it was but fair to say that the Jubilee was brought about by the efforts of our predecessors, whose work we inherited. The committee had often had long faces and carried a begging bowl, but on the other side there had been many extra pages in The Ringing World - in fact 40 pages in all - equivalent to two complete Ringing Worlds. There were many more photographs, which were a popular item. We are not complacent about this, he said, and we have a number of critics. We welcome criticism, he went on, particularly constructive criticism - either for publication or to the editor or convener. To those critics who wanted more articles printed, this could be supplied if the critics were prepared to write them. It was not possible for certain of the well-known contributors to be writing articles every week. Any good articles would be printed when they were received. Mr. Staniforth seconded the proposal. Mr. G. W. Critchley queried the difference in taxation paid, to which Mr. Wilson said he would make inquiry and let him know in due course. The Editor, upon being invited by the president to speak, confirmed Mr. Wilson’s comments, thanked the committee, Council members and many contributors for their help, encouragement and support and said he would endeavour to carry out his duties impartially and to the best of his limited ability. The report was adopted, as were the accounts of The Ringing World, proposed by Mr. E. A. Barnett, who gave several explanations about investments, etc. Mr. F. Dukes seconded, and the accounts of the Central Council, also proposed by Mr. Barnett, and seconded by Mr. R. S. Anderson, were also approved. In moving the adoption of the report of the Towers and Belfries Committee, Mr. Sharpe stated that for various reasons this was shorter than usual, it having been difficult to contact individuals during the postal strike. The greatest number of inspections in one county had been made in Somerset. It was gratifying that two-thirds of the requests for inspections had come from architects advising on restoration work. He had been unable to tackle all the inspections asked for, but during the coming summer he had hopes of doing several which had been outstanding for some time. Mr. Sharpe said he did not want the committee reduced too much in numbers, as there was plenty of work for them all. He thanked those who had helped him during the past year, and particularly Mr. Brian Threlfall for his talk the previous evening, which he (the speaker) was unable to attend. Mr. Halls said they all had been waiting a long time for the report. When would the final draft be ready and printed? Mr. Sharpe replied that estimates were at present being obtained and it was not possible to give a date because of printing difficulties. Mr. Hartless queried whether all counties needed “shire” at the end. He knew some were incorrect. The reply was that it was policy to follow precedent. The report was then approved. The president then said he had omitted last year to welcome Father Paulinus of Buckfast Abbey, representing the Guild of Devonshire Ringers. He immediately rectified this by addressing to him a friendly greeting, to which Father Paulinus briefly replied. The Literature and Press Committee report was agreed on the proposition of Mr. E. C. Shepherd, seconded by Mr. F. Dukes. Mr. W. G. Wilson said that The Illustrated London News was preparing an article for its Christmas issue and he had agreed to help advise on it. The report was adopted, following which there was a brief interval for tea, served in a nearby room. On resuming, the Broadcasting and Television report was proposed for acceptance by the Council on the call of Mr. Harold Pitstow, who apologised for the omission of Mrs. Jacqueline King’s name from the members of the committee. He did not know whose omission it was, his own or the persons responsible for copying the report. Mr. Seager seconded, and he was followed by Mr. Dukes, who spoke of the broadcasting from Eire and Northern Ireland and clarified the position there. Mr. C. Pipe said it was a good report but asked if it were not possible for more practical advice to be given to the B.B.C. on good and bad bells and good and bad ringing. He mentioned several recordings used recently and said that the B.B.C. must have many good recordings it could use. Could not the convener advise the B.B.C. what to use and see that the bad recordings were destroyed, or at any rate not played? Mr. Wilson asked if an amendment could be accepted to the report - the letter which Mr. Pitstow had sent to The Ringing World, which, when added, would make the report complete. This amendment was agreed, and Mr. Pitstow said he had tried to get the B.B.C. to change some of their recordings. He had chosen eight for their use and the Elstow recording (which was criticised) was not among that eight. The B.B.C. kept their previous four recordings and added three to them - Elstow, Mancroft and Birmingham. It was not possible to tell the B.B.C. what they should or should not use. It depended on the man who was responsible for the broadcast. The Christmas broadcasts were now satisfactory, as Mr. John Haslam, the man in charge, had become very knowledgable on bells and bellringing. The Elstow recording, said Mr. Pitstow, was made for Bunyan’s Pilgrim’s Progress, and because Bunyan rang those bells, that counted far more than the rather bad Minor which was rung for the recording. For Sundays the B.B.C. were now choosing twelve recordings and each would be used during one month of the year. The committee could and would advise, but the B.B.C. made the final decision. The Rev. John Scott asked Mr. Pitstow to persuade the B.B.C. not to use joined recordings. When the report of the Joint Committee for 1970 was discussed Mr. F. Blagrove asked if it could be taken in two parts - Part B and then Part A, as the latter needed a decision. The Standing Committee requested the Joint Committee to consider the desirability or otherwise of changing certain dubious names which had been given recently to peals. The Joint Committee had done so but there was no unanimous decision. He then gave some of the names that had been queried, and said in some cases if the names were connected with some individual or with a footnote they could become offensive. The committee, however, could not agree or decide what was to be done. They suggested that the phrase be added at the end of the existing decision whereby “the Council could if it wished change the name of any method which had been rung during the previous year.” He formally proposed the adoption of the report and this decision. Mr. Sibson referred to the previous work of the Joint Committee. In 1969 a resolution was passed which stated “That peal reports shall state the number and names of all methods and variations separately”. In the current issue of The Ringing World a footnote to a peal of Doubles requested a stamped addressed envelope for anyone who required details of methods, etc., rung. There were a number of similar peals in the offing which were similar, and he asked if The Ringing World was going to continue this, or if the Council had reversed its previous decision. The chairman invited Mr. Wilson to speak on the matter. Mr. Wilson said that it was a question of cost. If the Council instructed The Ringing World to spend about £14 to publish one peal, such as the one mentioned, it would be done. The few people who required the information could have had copies of the methods and this would have avoided the extra expense. Ninety-five per cent. of the readers did not want to see a column or two taken up with one peal, and nor did they want to have to pay extra for printing it. It was for the Council to decide whether or not this type of peal was to be printed in full or not. If there were to be many similar peals the price of setting the type for them would be increased, irrespective of the normal increase in printing costs, and later there would be criticism that too much money was being spent on a few peals in which a very small proportion of the readership was interested. He knew there was a great deal of enjoyment in ringing peals of Doubles, but it was necessary to face facts. These extra costs were a burden on the finances of The Ringing World and affected the cost of production. Mr. Mayne said there were two questions raised: (1) reversal of the previous decision of the Council, and (2) the point that peals were not only current news but historical records. If records were abbreviated, eventually it would cause difficulties. It was for posterity that such peals were recorded. It did not have any relevance whether it was six bells or twelve bells. It was important that peals were reported correctly. He doubted if one peal of Doubles would take up more space than the 300 which was the drop in numbers during the year. Mr. J. Millhouse said The Ringing World Committee had reversed its decision and let the Lincoln Guild in the cart. He was very concerned about it. He had sent a resolution from the Lincoln Guild to The Ringing World two years ago. He had had a reply that while the present editor was in office the peals would be printed in full. And yet within a short period a peal for the Lincoln Guild was reported without the method names. It was not playing the game with the members. The chairman said he sensed some sympathy with the peal ringers and accordingly if there is to be a decision on this matter, that decision was that peals will be recorded in full. He asked the Council to revert to the original report. This was adopted, two hands being raised against. The president (Mr. John Freeman) invited the members to consider item 14 on the agenda, which was to determine the date of the meeting in 1972 when the Council meet in London. Air Commodore J. S. Mason explained the preliminary details that had been made and formally proposed that the meeting be held during the Spring Bank Holiday week-end, 1972, and the date Tuesday, May 30. Mr. D. E. Sibson seconded and asked that those members who had not returned the questionnaire should do so without delay. It did not commit them in any way but gave a guide as to what arrangements would have to be made. When the place for the 1973 Council meeting (item 15) was brought up, there was no invitation extended from any of the Associations to the Council and no decision was therefore possible, and the final item, any other business, was opened. Mr. E. A. Barnett gave the attendance as follows: 43 associations fully represented, 106 members present, 16 associations partly represented (39 present, 20 absent), 4 associations not represented (4 members absent); life members, 7 present, 2 absent; honorary members, 16 present, 8 absent; the total, 168 members present and 34 absent. This was very much in line with the attendance in previous years, for in 1969 and 1970 there were 170 present, whilst in 1968 there were 166. The Rev. John Scott congratulated the president on the manner in which he had conducted the meeting (applause), which Mr. Freeman acknowledged and continued by thanking all concerned with the arrangements (R.W., p. 524). Life Members: E. A. Barnett, J. Freeman, F. W. Perrens, F. Sharpe, E. C. Shepherd, Canon A. G. G. Thurlow, T. W. White. Honorary Members: B. Austin, Mrs. E. A. Barnett, F. E. Collins, C. W. Denyer, G. R. Drew, Mrs. G. R. Drew, J. L. Garner-Hayward, F. N. Golden, F. E. Haynes, S. J. Ivin, C. K. Lewis, J. R. Mayne, H. N. Pitstow, R. B. Smith, R. F. B. Speed, P. L. Taylor. Bath and Wells D. Assn. : J. H. Gilbert, E. Naylor, A. H. Reed, H. J. Sanger. Bedfordshire Assn. : K. H. Fleming, A. E. Rushton. Cambridge U. Guild: B. D. Threlfall. Chester D. Guild: B. Jones, A. J. Martin, D. Mottershead. Coventry D. Guild: Mrs. D. E. Beamish, H. M. Windsor. Derby D. Assn. : D. R. Carlisle, G. A. Halls, Rev. R. D. St. John Smith. Devon Assn. : B. E. Bartlett. Durham and Newcastle Assn. : K. Arthur, D. A. Bayles. E. Derbyshire and W. Notts Assn. : E. J. Sollis. E. Grinstead and District Guild: K. Game. Ely D. Assn. : J. G. Gipson, E. H. Mastin, A. M. Barber, H. S. Peacock. Essex Assn. : J. Armstrong, F. B. Lufkin, Miss H. G. Snowden. Gloucester and Bristol D. Assn. : A. L. Barry, A. R. Peake, J. R. Taylor, C. A. Wratten. Guildford D. Guild: T. Page, P. G. Smart, W. H. Viggers. Guild of Devonshire Ringers: Fr. P. Angold, D. R. Bould, N. Mallett, Rev. J. G. M. Scott. Hereford D. Guild: P. Hughes, A. T. Wingate. Hertford C. Assn. : W. Ayre, B. M. Barker, R. G. Bell, G. Dodds. Irish Assn. : P. W. Brown, F. E. Dukes. Kent C. Assn. : P. A. Corby, S. Jenner, I. H. Oram. Ladies’ Guild: Mrs. N. Summerhayes, Miss D. E. Colgate, Mrs. P. J. Staniforth. Lancashire Assn. : N. Bennett, C. Crossthwaite, J. P. Partington, F. Reynolds. Leicester D. Guild: S. Burton, J. M. Jelley, P. J. Staniforth, B. G. Warwick. Lincoln D. Guild: J. Bray, G. E. Feirn, J. L. Millhouse, P. Reynolds. Llandaff and Monmouth D. Assn. : Mrs. D. J. King, T. M. Roderick. London C. Assn. : H. W. Rogers, Mrs. H. W. Rogers, G. W. Shanks, W. G. Wilson. Middlesex C. Assn. : F. T. Blagrove, G. W. Critchley, T. J. Lock, C. H. Rogers. Midland C. Guild: J. W. Cotton. N. Staffordshire Assn. : R. S. Anderson, C. S. Ryles. N. Wales Assn. : Dr. E. V. Woodcock. Norwich D. Assn. : P. M. Adcock, H. W. Barrett, M. Cubitt, N. V. Harding. Oxford D. Guild: W. Butler, N. J. Diserens, P. Walker. Oxford U. Society: J. E. Camp, D. J. Roaf. Peterborough D. Guild: E. Billings, B. Hendry, J. Linnell. St. David’s D. Guild: absent. St. Martin’s Guild: G. E. Fearn, R. W. Pipe. Salisbury D. Guild: E. J. Hitchins, Rev. R. Keeley, G. S. Morris. Sheffield and D. Society: J. Seager. Society of R. Cumberland Youths: J. S. Barnes, D. Beresford, W. H. Dobbie, D. E. Sibson. Society of Sherwood Youths: G. A. Dawson. Southwell D. Guild: W. L. Exton, R. B. Mills. Staffordshire Archdeaconry Society: C. F. W. Eyre, M. W. Fairey, C. M. Smith. Suffolk Guild: T. N. J. Bailey, H. W. Egglestone, C. W. Pipe, Rev. L. R. Pizzey. Surrey Assn. : A. P. Cannon, C. F. Mew. Sussex C. Assn. : G. Francis, J. R. Norris, R. W. R. Percy, W. L. Weller. Swansea and Brecon D. Guild: G. I. Lewis. Truro D. Guild: W. C. Boucher, F. M. Bowers, A. J. Davidson, A. Locke. Universities Assn. : Rev. M. Melville. University of Bristol Society: T. P. Edwards. University of London Society: A. J. Frost. University of Manchester Guild: absent. Winchester and Portsmouth D. Guild: A. V. Davis, Canon K. W. H. Felstead, J. Hartless, R. R. Savory. Worcestershire and Dist. Guild: B. C. Ashford, D. Beacham, A. J. Brazier, W. B. Cartwright. Yorkshire Assn. : W. E. Critchley, P. S. Johnson, W. F. Moreton. The establishing by the B.B.C. of local radio Stations has increased appreciably the broadcasting of bells. These stations, generally speaking, are very ready to use bells in connection with local occasions, and one - B.B.C. Norwich - emphasises that it is delighted to take any practicable opportunity to broadcast bells, ringing, etc., if reasonable prior notice can be given of events. If ringers in East Anglia, therefore, are ringing for special services or occasions they should acquaint the News Editor, B.B.C. East Anglian Centre, St. Catherine’s Close, All Saints Green, Norwich, NOR 88B. No doubt other stations will be just as interested if approached. As has been publicised, the convener was invited by the B.B.C. to edit the recordings to be used on the disc “Church Bells”, marketed by Radio Enterprises Ltd., and in this he was assisted by Alan Patterson, junior steward of the Ancient Society of College Youths. As the recordings were to be selected from those preserved in the archives of the B.B.C. the choice was very limited, and it was disappointing to find that so many recordings made for past broadcasts are not now available. Towards the end of the year the convener was in discussion with the B.B.C. on the subject of using bells to introduce the morning programmes not only on Sundays but on every day of the weak, and this now is in operation. The plan at present is to use one tower for each month of the year. Scotland.- No broadcasting at all during the year has been reported. The Scottish Regional Home Service is using bells now to introduce the daily programmes. N. Ireland.- The 12 of St. Patrick’s Cathedral, Dublin, were heard ringing Grandsire Cinques after the Christmas Eve carol service, and on New Year’s Eve the bells of Christ Church Cathedral, Dublin, were on the air. A service broadcast from St. Thomas’s, Belfast, was preceded by the sound of the bells. North Region.- The only broadcasting reported is that of Wakefield for the “Christmas Bells” programme, and for this there is comment on the great deal of trouble taken by the recording engineer to secure as good a recording as possible. Denis Bayles made two small contributions to Radio Durham when approached by their reporters. Midland Region.- No special broadcasting is reported from this region. Local stations have continued using recordings of local towers on occasions. East Anglia.- Early in the year the bells of St. Mary’s, Peterborough were broadcast in the B.B.C.’s radio bulletin as part of an effort to recruit new ringers. Anglia Television showed, in April, St. Andrew’s, Chesterton, Cambridge, the bells having been recorded previously. They provide background for advertisements! In November, Radio 4 broadcast an excellent “Monday Night Theatre” play called “Devil Take Ye”, set in Laxfield, Cratfield and Debenham in the year 1700, a country story in which ringers played a prominent role and Laxfield bells were heard. Also in November, Suffolk and Norfolk veterans at Debenham were mentioned and photographed and the bells were heard on radio and the television “Look East” programme. In the Radio 4 programme “About Anglia”, George Pipe was interviewed regarding Ipswich bells and the effort to get those of St. Mary-le-Tower rehung. West Region.- In an interview with B.B.C. programme “Points West”, the Vicar of St. Stephen’s, Bristol, spoke of the task of strengthening the tower of that church to prevent its collapsing and how the bells had been removed to be augmented to a ring of 12. Film showed one of the bells being moved into position for hoisting to the bell chamber. Mention has been made in The Ringing World of the collaboration of the Gloucester and Bristol Association with the new station Radio Bristol, and we understand that recordings have been made by members of the Association, under the leadership of its master, to be used as introductions to the Sunday programmes and now may be in use daily. An offer of the return of a B.B.C. tape held by the association, containing some excellent recordings of the bells of Chewton Mendip, was accepted, and it is hoped that these fine bells will be heard on the air again. The recordings are of Stedman Triples and Double Norwich C.B.M. and were broadcast originally in the programme “Ring Out, Wild Bells” in 1963. Wales, as usual, provides several items of interest. B.B.C. Radio “Good Morning Wales” interviewed a ringer, 18 years of age, who claimed that his asthma had been cured by learning bell-ringing! Harlech TV, during a series of stories called “Kate” used a recording of some unidentified excellent Major ringing for some minutes as a background. Major ringing was heard again on the same medium during the “Crossroads” serial before a supposed carol service (possibly the same recording). In December B.B.C.1 televised the sung Eucharist in Llandaff Cathedral, and this was preceded by about two minutes of ringing. London Region.- In June the B.B.C. programme “Woman’s Hour” broadcast a long interview with Mr. F. Sharpe, in which he told of his visits to towers all over the country and related many of his varied adventures. The bells of Guildford Cathedral were heard on the air for the first time when they were rung before the service broadcast from the Cathedral on Christmas Day. H. N. PITSTOW (convener), D. A. BAYLES, J. T. DUNWOODY, G. E. FEARN, H. J. SANGER, G. A. THURLOW, R. S. WILSON. The tables printed here will bring up to date the Central Council Collection of Surprise methods as far as the end of 1970. Appendix A: July 2, 1965, page 449. Appendix B: June 17, 1966, page 390, and July 15, 1966, page 461. Appendix C: June 30, 1967, pages 462 and 463. Appendix D: June 12, 1968, page 555. Appendix E: July 4, 1969, page 523, and July 25, page 594. Appendix F: Aug. 28, 1970, page 684, and Sept 4, page 704. 1G. Goring (mx) - 34 - 14 - 12 - 36 - 12 - 58.12.56.34.1. 2G. Banewella (g) - 34 - 1458 - 56 - 16 - 14 - 38 - 16 - 5. 3G. Burghclere (b) - 36 - 1456 - 58 - 38 - 14 - 38 - 12 - 7. 4G. Privett (f) - 38 - 14 - 12 - 38 - 14 - 58 - 36.14.5. 5G. Lennoxville (c) - 38 - 14 - 12 - 38.14 - 14.58 - 56 - 3. 6G. Wroxton (d) - 38 - 14 - 1256 - 36.14 - 14.58.16 - 16.7. 7G. Accrington (a) - 38 - 14 - 1256 - 38 - 14 - 58 - 36 - 7. 8G. Easingwold (b) - 38 - 14 - 1258 - 16 - 12 - 1258 - 16.34.7. 9G. Kingsthorpe (b) - 38 - 14 - 1258 - 16 - 14 - 1238 - 1256 - 7. 10G. Aynho (b) - 38 - 14 - 1258 - 16 - 14 - 3458 - 1236 - 7. 11G. Harpenden (b) - 38 - 14 - 1258 - 16 - 14 - 38 - 56.12.7. 12G. Foxhall (b) - 38 - 14 - 1258 - 16 - 34 - 3458 - 16.34.7. 13G. Leander (b) - 38 - 14 - 1258 - 36 - 34 - 58.36 - 16.7. 14G. Umbala (b) - 38 - 14 - 1258 - 36.14 - 14.38 - 34 - 7. 15G. Ringwood (f) - 38 - 14 - 1258 - 36.14 - 14.58.36.12.56.1. 16G. Bilsborrow (b) - 38 - 14 - 56 - 16 - 14 - 3458 - 36 - 1. 17G. Delaford (f) - 38 - 14 - 56 - 36.12 - 14.38.14.36 - 3. 18G. Fordingbridge (f) - 38 - 14 - 58 - 1238 - 34 - 58 - 14 - 3. 19G. Grafham (b) - 38 - 14 - 58 - 16 - 12 - 1458.36.14 - 7. 20G. Richmondshire (b) - 38 - 14 - 58 - 16 - 12 - 38.16 - 1236.7. 21G. Checkendon (b) - 38 - 14 - 58 - 36 - 12 - 1458 - 16.34.7. 22G. Versailles (b) - 38 - 14 - 58 - 36 - 14 - 1238 - 1456 - 7. 23G. Earls Barton (b) - 38 - 14 - 58 - 36.14 - 14.58.12.36.12.7. 24G. Overstone (f) - 38 - 14 - 58.12.36 - 14 - 38 - 34 - 1. 25G. Easter (b) - 38 - 14 - 58.12.36.14 - 14.38 - 12 - 7. 26G. Aldgate (b) - 38 - 1456 - 58 - 1236 - 14 - 58 - 16 - 5. 27G. Raglan (c) - 38 - 1458 - 56 - 16 - 12 - 58 - 56 - 1. 28G. Aldermary (l) - 56 - 14 - 12 - 38 - 14 - 38 - 16 - 3. 29G. Machen (mx) - 56 - 14 - 56 - 36 - 14 - 38 - 1456 - 5. 30G. Blaenafon (d) - 56 - 14 - 56 - 38 - 14 - 1258.36.12.56.7. 31G. Selhurst (l) - 56 - 14 - 56 - 38 - 14 - 1458 - 12 - 5. 32G. Newton Nottage (l) - 56 - 14 - 56 - 38 - 14 - 58.14 - 34.5. 33G. Wantage (f) - 56 - 14 - 56 - 38 - 34 - 58 - 34 - 5. 34G. Felixstowe (a) - 56 - 14 - 58 - 16 - 14 - 58 - 56 - 1. 35G. Cholsey (e) - 58 - 14 - 56 - 16 - 34 - 58.14.56.14.3. 36G. Caerffili (mx) - 58 - 14.58 - 58.1236 - 14 - 58.14 - 14.3. 37G. Usk (mx) - 58 - 14.58 - 58.1236 - 14 - 58.14 - 34.1. 38G. Peterstone Wentloog (mx) - 58 - 14.58 - 58.36 - 14 - 1458 - 14 - 1. 39G. Gwent (mx) - 58 - 14.58 - 58.36.14 - 12.58 - 12 - 1. 40G. Blenheim (a) - 58 - 16 - 12 - 1238 - 14 - 38 - 14 - 3. 41G. Meldreth (c) - 58 - 16 - 12 - 16 - 14 - 3458 - 34 - 1. 42G. Ilkley (j) - 58 - 16 - 12 - 38 - 34 - 58 - 14 - 5. 43G. Teston (mx) - 58 - 16 - 12 - 38.12 - 14.38 - 36.14.3. 44G. Perry Barr (b) - 58 - 16 - 1258 - 36.14 - 14.38 - 14 - 7. 45G. Stonehenge (d) - 58 - 16 - 56 - 1236 - 34 - 1238 - 14 - 7. 46G. Aldershot (f) - 58 - 16 - 58 - 36.14 - 34.58 - 14 - 1. 47G. Romsey (f) 38 - 38.16 - 12 - 36 - 14 - 58.34.16 - 5. 48G. Horam (f) - 38 - 14 - 56 - 38 - 14 - 56. 49G. Aldsworth (b) - 36 - 14 - 12 - 30 - 12 - 30 - 14 - 30.16 - 16.9. 50G. Feering (b) - 30 - 14 - 12 - 30.14 - 14.30.14 - 14.30.14 - 34.9. 51G. St. Michael (b) - 30 - 14 - 1250 - 1236 - 1270 - 1238 - 14 - 50 - 18 - 9. 52G. Axminster (b) - 30 - 14 - 1250 - 16 - 14 - 58 - 16 - 70 - 18 - 7. 53G. Halstead (f) - 30 - 14 - 56 - 36 - 14 - 50.14 - 14.50.14 - 14.5. 54G. Elveden (f) - 30 - 14 - 56 - 36.14 - 14.50.14 - 14.50 - 14 - 5. 55G. Bushmead (b) - 30 - 14 - 58 - 16 - 1270 - 38 - 14 - 70 - 18 - 9. 56G. Cullompton (f) - 30 - 14 - 50 - 16 - 1470 - 38.14 - 12.30.14 - 14.5. 57G. Eldene (f) - 30 - 14 - 50 - 16 - 70 - 18 - 36 - 70 - 18.34.7. 58G. Hampton (b) - 30 - 14 - 50 - 16 - 70 - 18.34 - 12.30 - 14.36.9. 59G. Findern (b) - 30 - 14 - 50 - 36 - 1470 - 38 - 14 - 30 - 34 - 9. 60G. Savernake (c1) - 30 - 14.50 - 12.30.14 - 14.50 - 16 - 70 - 38.14.9. 61G. Latton (b) - 30 - 16 - 56 - 30 - 14 - 30 - 14 - 50.78.16.78.9. 62G. Ridgeway (e) - 30 - 16 - 50 - 18 - 14 - 38.16 - 16.70.58.34.58.3. 63G. Ogbourne (f) - 30 - 16 - 50 - 18 - 14 - 50 - 16 - 30.78.14.78.1. 64G. Cherhill (f) - 30 - 16 - 50 - 18 - 14 - 50 - 16 - 50 - 16.34.5. 65G. Wexford (f) - 30 - 16 - 50 - 18 - 14 - 50 - 16 - 50.12.36.14.5. 66G. Axford (f) - 30 - 16 - 50 - 18 - 14 - 50 - 16 - 50.78.16.58.7. 67G. Sarum (f) - 30 - 16 - 50 - 18 - 14 - 50.36 - 16.70.16.58.34.1. 68G. Severn (e) - 30 - 16 - 50 - 18 - 1470 - 30 - 16 - 50 - 18 - 9. 69G. Yatesbury (f) - 30 - 16 - 50 - 18 - 70 - 50 - 16 - 30.78.14.78.1. 70G. Invergarry (e) - 30 - 16 - 50 - 18 - 70 - 50.16 - 36.70.1258 - 12.9. 71G. Malvern (e) - 30 - 16 - 50 - 18 - 70 - 50.16 - 36.70.58 - 12.9. 72G. Thames (e) - 30 - 16 - 50 - 18 - 70 - 50.16 - 36.70.58 - 34.9. 73G. Badbury (e) - 30 - 16 - 50 - 18 - 70.14.30 - 36 - 50 - 12 - 9. 74G. Bratton (e) - 30 - 16 - 50 - 18.34 - 14.50.34.16 - 30 - 34 - 3. 75G. Leyland (e) - 30 - 16 - 50 - 38 - 12 - 30 - 14 - 30 - 16 - 1. 76G. Tamar (e) - 30 - 16 - 50 - 38.12.70 - 18 - 16 - 50 - 18 - 3. 77G. Elgin (f) - 56 - 14 - 56 - 30 - 14 - 50 - 14 - 50.14 - 14.5. 78G. Edington (f) - 56 - 14 - 56 - 30 - 14 - 50 - 14 - 70 - 58 - 7. 79G. Silbury (mx) - 56 - 14 - 70 - 36.1470 - 1470.58.14 - 12.70 - 14.56.3. 80G. Avebury (mx) - 56 - 14 - 70 - 36.1470 - 1470.58.14 - 14.70.12.56.34.1. 81G. Scawthorpe (f) - 56 - 16 - 50 - 16 - 14 - 50 - 34 - 50 - 34 - 5. 82G. Seaton (f) - 56 - 16 - 50 - 16 - 14 - 50 - 34.12.50 - 34.12.5. 83G. Wordsworth (f) - 50 - 14 - 12 - 30 - 12 - 30 - 14 - 30 - 16 - 1. 84G. Kennett (f) - 50 - 14 - 56 - 36.14 - 14.50 - 14 - 50 - 14 - 5. 85G. Hodson (f) - 50 - 14.50 - 12.30 - 14 - 50 - 14 - 50.14 - 14.5. 86G. Claines (f) - 50 - 14.50 - 12.30 - 14 - 50 - 14 - 50.78 - 58.7. 87G. Somerford (f) - 50 - 14.50 - 12.30 - 14 - 50 - 14 - 50.78.36.58.3. 88G. Selborne (f) - 50 - 14.50 - 12.30.14 - 14.50.14 - 14.50.14 - 14.5. 89G. Slough (c1) - 50 - 16 - 1270 - 18 - 14 - 58 - 16 - 70.14 - 34.9. 90G. Stone (c1) - 50 - 16 - 1270 - 18 - 14 - 58 - 16 - 70.16 - 36.9. 91G. Preshute (b) - 50 - 16 - 1270 - 38 - 14 - 30 - 16 - 30 - 36.58.9. 92G. Minal (c1) - 50 - 16 - 70 - 38 - 14 - 58 - 16 - 70.14.78.14.9. 93G. Bath (mx) - 70 - 14 - 56 - 36.70.14.70.1458 - 56 - 70 - 14 - 1. 94G. Balscott (mx) - 70 - 14 - 56 - 36.70.14.70.58 - 56 - 1470 - 14 - 1. 95G. Avonmouth (f) - 70 - 18 - 50 - 16 - 14 - 30.56.14.56.30 - 18 - 1. 96G. Abergele (f) - 70 - 18 - 50 - 16.34.70.14.58.36.14.56.30.14 - 14.5. 97G. Devizes (f) 36.70.36.14 - 1258 - 38 - 14 - 50.16 - 16.70 - 58 - 7. 98G. Miserden (f) 36.70.36.14 - 58 - 1238 - 1470 - 38 - 16 - 70 - 18 - 1. 99G. Foxhill (f) 30 - 30.14 - 12 - 30 - 14 - 30 - 36 - 1450.36 - 36.9. 100G. Lanchester (e) 30 - 30.14 - 12 - 30.14 - 12.50.16 - 36.70.18 - 18.7. 101G. Tintern (f) 30 - 30.14.50 - 12.30.14 - 14.30.14 - 16.70.18 - 18.7. 102G. Dudley (f) 30 - 30.14.50.12 - 30.14 - 14.50.16 - 16.70.18.34.18.7. 103G. Aylsham (f) 30 - 50.14 - 12 - 30 - 14 - 50.16 - 36.1470 - 58 - 9. 104G. Llandaff (b) 56 - 56.14 - 50 - 36 - 1470 - 38 - 16 - 50 - 18 - 7. 105G. Trafalgar (b) - 34 - 145T - 56 - 16 - 14 - 3T - 16 - 5T - 18 - 7T - 10 - 9. 106G. Painswick (b) - 36 - 14 - 5T - 16 - 12 - 5T - 16 - 5T - 18 - 7T - 10 - E.
107G. Lindum (f) - 36 - 14 - 5T - 16 - 14 - 3T - 14 - 5T - 14 - 5T - 14 - 5. 108G. Yarmouth (b) - 38 - 1458 - 9T - 18 - 129T - 10 - 90 - 7T - 78 - 167T - 1690 - 1. 109G. Elkington (b) - 30 - 14 - 5T - 36 - 1470 - 58 - 369T - 30.14.58.14.7T.14.36.14.E. 110G. Warwickshire (b) - 3T - 14 - 12 - 3T - 12 - 3T - 14 - 5T - 16 - 9T - 10 - E.
111G. Zelah (b) - 3T - 14 - 125T - 36 - 347T - 1458 - 569T - 1670 - 78 - 189T - 10 - E.
112G. Uxbridge (f) - 3T - 14 - 56 - 16 - 34 - 5T - 14 - 5T - 14 - 5T - 14 - 5. 113G. Christchurch (b) - 3T - 14 - 5T - 1236 - 127T - 38 - 149T - 50 - 16 - 7T - 10 - E.
114G. Wensleydale (b) - 3T - 14 - 5T - 16 - 127T - 18 - 12 - 3T - 14 - 5T - 16 - E.
115G. Hampstead (b) - 3T - 14 - 5T - 16 - 127T - 38 - 129T - 30 - 14 - 5T - 18 - E.
116G. Swindon (b) - 3T - 14 - 5T - 16 - 7T - 18 - 9T - 10 - 16 - 7T - 58 - E.
117G. Dorking (c1) - 3T - 14 - 5T - 16 - 7T - 18 - 9T - 10 - 78 - 7T - 78 - 9. 118G. Worsley (mx) - 3T - 14 - 5T - 36 - 7T - 18 - 149T - 30 - 14 - 3T - 14 - 3. 119G. Blackley (b) - 3T - 16 - 56 - 3T - 14 - 3T - 14 - 145T - 36 - 145T - 36 - E.
120G. Buckfast (a) - 3T - 16 - 56 - 3T - 14 - 5T - 16 - 7T - 18 - 9T - 30 - 1. 121G. Cray (e) - 56 - 14 - 56 - 36 - 34 - 58 - 34 - 70 - 34 - 9T - 34 - 1. 122G. Cornwall (l) - 56 - 14 - 56 - 3T - 14 - 5T - 14 - 5T - 14 - 5T - 14 - 5. 123G. Double Dublin (mx) - 56 - 14 - 78 - 36.14.90.34.58.90.34.9T.70 - 56 - 9T - 78 - 1. 124G. Trowbridge (b) - 5T - 14 - 12 - 3T - 12 - 3T - 14 - 5T - 16 - 7T - 10 - 9. 125G. Lutterworth (c1) - 5T - 14 - 56 - 36 - 12 - 3T - 14 - 5T - 16 - 7T - 18 - E.
126G. Hampshire (mx) - 5T - 14 - 56 - 36 - 78 - 58 - 90 - 7T.14 - 14.9T - 14 - 1. 127G. Essex (h) - 5T - 14.5T - 5T.16 - 14 - 3T.14 - 14.5T.14 - 14.5T.14 - 14.5. 128G. Worcester (mx) - 5T - 14.5T - 5T.36.14 - 14.5T - 14 - 7T - 78 - 7T - 78 - 1. 129G. Redcliffe (mx) - 5T - 14.5T - 5T.38 - 3478 - 30 - 5690 - 50.18 - 18.9T - 18 - 1. 130G. Jersey (b) - 5T - 16 - 12 - 18 - 14 - 10 - 16 - 10 - 18 - 9T - 70 - 9. 131G. Trafford (f) - 5T - 16 - 12 - 36 - 14 - 3T - 16 - 3T - 36 - 3T - 36 - 3. 132G. Cotswold (b) - 5T - 16 - 127T - 1238 - 149T - 1450 - 36 - 167T - 58 - 189T - 70 - E.
133G. Worcestershire (b) - 5T - 16 - 127T - 38 - 149T - 50 - 16 - 70 - 18 - 189T - 70 - 9. 134G. Oxfordshire (c1) - 5T - 16 - 127T - 38 - 149T - 50 - 16 - 70 - 78 - 9T - 18 - E.
135G. Kilsby (b) - 5T - 16 - 56 - 3T - 34 - 3T - 14 - 5T - 16 - 7T - 10 - 9. 136G. Xenia (a) - 5T - 16 - 5T - 18 - 7T - 10 - 9T - 10 - 78 - 7T - 70 - 1. 137G. Apsley (b) - 5T - 16 - 5T - 38 - 147T - 50 - 169T - 70 - 18 - 7T - 78 - E.
138G. Dodford (b) - 5T - 16 - 7T - 18 - 9T - 10 - 12 - 3T.14 - 14.3T.14 - 14.E. 139G. Jedburgh (b) - 5T - 16 - 7T - 18 - 9T - 10 - 90 - 10 - 78 - 7T - 10 - 9. 140G. Wexham (b) - 7T - 18 - 125T - 36 - 14 - 5T - 16 - 7T - 18 - 9T - 10 - E.
141G. Leominster (mx) 34 - 34.16 - 56 - 3T - 14 - 3T - 36 - 5T - 36 - 5T - 36 - 5. 142G. Belfast (mx) 34 - 5T.14 - 12 - 3T.12 - 14.3T.16 - 12.3T.16 - 12.3T.16 - 12.3. 143G. Clerkenwell (b) 34 - 5T.14 - 5T - 3T.14 - 14.5T.36 - 16.7T.58 - 18.9T.70 - 10.9. 144G. Preston (b) 36 - 56.14.5T - 5T.16 - 34 - 58 - 12 - 70 - 12 - 9T - 12 - 1. 145G. Ribbleton (b) 36 - 56.14.5T - 5T.16 - 34 - 58 - 1256 - 1470 - 14.56.149T - 14 - 1. 146G. Strathclyde (k) 36 - 56.14.5T - 5T.36 - 14 - 3T.16 - 16.3T.16 - 16.3T.16 - 16.3. 147G. Verulam (b) 36 - 56.14.5T - 5T.36 - 14 - 58.14 - 14.70.14 - 14.9T.14 - 14.3. 148G. Lilbourne (f) 38 - 36.1478 - 12.7T.36.14 - 14.5T.16 - 16.7T.14.58.14.9T.14 - 14.9. 149G. Shropshire (b) 3T - 3T.14 - 12 - 36 - 12 - 58 - 12 - 70.14 - 14.9T.14 - 14.3. 150G. Moorgate (f) 3T - 3T.14 - 12 - 3T - 14 - 5T - 16 - 7T - 1458 - 349T - 16 - 9. 151G. New Gloucester (mx) 56 - 56.14.78 - 78.36.90.12.90.58 - 349T - 70 - 56 - 9T - 78 - 1. 152G. Manchester (a) 5T - 5T.14 - 5T - 36.14 - 14.58.14 - 14.70.14 - 14.9T - 14 - E.
153G. Dunsmore (b) 5T - 5T.14 - 5T - 36.14.9T.14.58.9T.14.9T.70.18 - 18.9T - 18 - 1. 154G. Cirencester (b) 70.36 - 1450.78.9T - 16 - 129T - 10 - 90 - 7T - 78 - 167T - 1690 - 1. 155G. Glasgow Little (g) 36 - 56.14.5T - 5T.36 - 14 - 3T.16 - 16.38. 156G. Clyde Little (mx) 36 - 56.14.5T - 5T.36 - 14 - 3T.16 - 16.3T.16 - 16.30. 157G. York (a) - 3f - 14 - 12 - 3f.14 - 14.3f.14 - 14.3f.14 - 14.3f.14 - 14.3f.14 - 14.3. 158G. Yorkshire (b) - 3f - 14 - 5f - 16 - 127f - 38 - 149f - 50 - 16Ef - 7T - 18 - 9f - 10 - A. 159G. Leatherhead (f) - 5f - 14 - 56 - 36.14 - 14.5f.14 - 14.5f.14 - 14.5f.14 - 14.5f.14 - 14.5. 160G. Newgate (f) 3f - 3f.14 - 12 - 3f.14 - 14.5f.16 - 16.7f.14.58.14.9f.14 - 14.9f.14 - 14.9. 161G. Leicestershire (a) 3f - 5f.14 - 5f - 3f.14 - 14.5f.14 - 14.5f.14 - 14.5f.14 - 14.5f.14 - 14.5. 162G. Fulham (mx) 56 - 56.14 - 5f - 36.14 - 14.5f - 14 - 3f - 34 - 3f - 34 - 3f - 34 - 1. Accrington 30 - 3 - 70 Putney 7G. Aldermary 16 - 4 - 70 Willesden 28G. Aldershot Rung in Spliced 46G. Aldgate 11 - 1 - 70 Hart Street, London, E.C. 26G. Axminster 17 -12 - 70 Balcombe 9C. Aynho 7 - 2 - 70 Rothwell 10G. Banewella 12 -12 - 70 Banwell 2G. Bilsborrow 21 -11 - 70 Quex Park 16G. Blaenafon 2 - 9 - 70 Blaenavon 30G. Blenheim 19 - 1 - 70 Witney 40G. Burghclere 7 - 3 - 70 Highclere 3G. Caerffili 1 - 5 - 70 Caerffili 36G. Checkendon 28 - 2 - 70 Checkendon 21G. Cheddar 7 - 3 - 70 Stamford Hill 11C. Cholsey Rung in Spliced 35G. Delaford Rung in Spliced 17G. Earls Barton 12 - 4 - 70 Earls Barton 23G. Easingwold 14 - 2 - 70 Tadcaster 8G. Easter 4 - 4 - 70 Buckingham 25G. Felixstowe 25 - 4 - 70 Benington 34G. Fordingbridge Rung in Spliced 18G. Foxhall 17 -10 - 70 Rothwell 12G. Goring Rung in Spliced 1G. Grafham 26 - 9 - 70 Eaton Socon 19G. Gwent 6 -11 - 70 Marshfield 39G. Harpenden 4 - 1 - 70 Harpenden 11G. Henbury 24 - 9 - 70 Cuckfield 80C. Horam Little 11 -10 - 70 Waldron 48G. Ilkley Rung in Spliced 42G. Kettering 21 - 7 - 70 Husborne Crawley 12C. Kingsthorpe 30 - 5 - 70 Northampton (All Saints) 9G. Launceston 15 - 8 - 70 Bristol Cathedral 39C. Leander 12 -12 - 70 Henley-on-Thames 13G. Lennoxville 3 -12 - 70 Witney 5G. Machen 14 -10 - 70 Machen 29G. Meldreth 27 - 6 - 70 Meldreth 41G. Newton Nottage 2 - 2 - 70 Newton Nottage 32G. Overstone 8 - 9 - 70 Moulton 24G. Perry Barr 21 - 2 - 70 Handsworth (Birmingham) 44G. Peterstone Wentloog 4 - 4 - 70 Peterstone Wentloog 38G. Portishead 3 - 9 - 70 Shoreditch 31C. Privett Rung in Spliced 4G. Raglan 10 - 1 - 70 Cookham 27G. Richmondshire Rung in Spliced 20G. Ringwood Rung in Spliced 15G. Romsey Rung in Spliced 47G. Selhurst 7 -11 - 70 Lambeth 31G. Sonning 21 -11 - 70 Bristol (St. Philip & St. Jacob) 63F. Stonehenge 1 - 8 - 70 Urchfont 45G. Teston 15 - 8 - 70 Chislehurst (St. Nicholas) 43G. Umbala 16 - 6 - 70 Moulton 14G. Usk 9 -10 - 70 Usk 37G. Versailles 24 -10 - 70 Spalding 22G. Wantage Rung in Spliced 33G. Wroxton 28 -11 - 70 Bloxham 6G. Abergele Rung in Spliced 96G. Aldsworth Rung in Spliced 49G. Avebury Rung in Spliced 80G. Avonmouth Rung in Spliced 95G. Axford Rung in Spliced 66G. Axminster Rung in Spliced 52G. Aylsham Rung in Spliced 103G. Badbury Rung in Spliced 73G. Balscott Rung in Spliced 94G. Bath Rung in Spliced 93G. Bratton Rung in Spliced 74G. Bushmead 27 - 7 - 70 Bedford (St. Paul) 55G. Cherhill Rung in Spliced 64G. Claines Rung in Spliced 86G. Cullompton Rung in Spliced 56G. Devizes Rung in Spliced 97G. Dudley Rung in Spliced 102G. Edington Rung in Spliced 78G. Eldene Rung in Spliced 57G. Elgin Rung in Spliced 77G. Elveden Rung in Spliced 54G. Feering Rung in Spliced 50G. Findern 12 -12 - 70 Crewe 59G. Foxhill Rung in Spliced 99G. Halstead Rung in Spliced 53G. Hampton Rung in Spliced 58G. Hodson Rung in Spliced 85G. Invergarry Rung in Spliced 70G. Kennett Rung in Spliced 84G. Lanchester Rung in Spliced 100G. Latton Rung in Spliced 61G. Leyland Rung in Spliced 75G. Llandaff 7 - 3 - 70 Llandaff Cathedral 104G. Malvern Rung in Spliced 71G. Minal Rung in Spliced 92G. Miserden Rung in Spliced 98G. Ogbourne Rung in Spliced 63G. Preshute Rung in Spliced 91G. Ridgeway Rung in Spliced 62G. St. Michael 31 -10 - 70 Southampton (St. Michael) 51G. Sarum Rung in Spliced 67G. Savernake Rung in Spliced 60G. Scawthorpe Rung in Spliced 81G. Seaton Rung in Spliced 82G. Selborne Rung in Spliced 88G. Severn Rung in Spliced 68G. Silbury Rung in Spliced 79G. Slough Rung in Spliced 89G. Somerford Rung in Spliced 87G. Stone Rung in Spliced 90G. Tamar Rung in Spliced 76G. Thames Rung in Spliced 72G. Tintern Rung in Spliced 101G. Wexford Rung in Spliced 65G. Wordsworth Rung in Spliced 83G. Yatesbury Rung in Spliced 69G. Apsley Rung in Spliced 137G. Belfast 26 - 9 - 70 High Wycombe 142G. Blackley Rung in Spliced 119G. Buckfast Rung in Spliced 120G. Christchurch Rung in Spliced 113G. Cirencester Rung in Spliced 154G. Clerkenwell Rung in Spliced 143G. Clifton 22 - 1 - 70 Birmingham Cathedral 79F. Clyde Little 12 -11 - 70 Birmingham Cathedral 156G. Cornwall Rung in Spliced 122G. Cotswold Rung in Spliced 132G. Cray Rung in Spliced 121G. Dodford Rung in Spliced 138G. Dorking Rung in Spliced 117G. Double Dublin Rung in Spliced 123G. Dunsmore Rung in Spliced 153G. Elkington Rung in Spliced 109G. Essex Rung in Spliced 127G. Fulham 30 - 5 - 70 Leicester Cathedral 86F. Glasgow Little 15 -10 - 70 Birmingham Cathedral 155G. Hampshire Rung in Spliced 126G. Hampstead Rung in Spliced 115G. Jedburgh Rung in Spliced 139G. Jersey Rung in Spliced 130G. Kilsby Rung in Spliced 135G. Leominster Rung in Spliced 141G. Lilbourne Rung in Spliced 148G. Lindum Rung in Spliced 107G. Lutterworth Rung in Spliced 125G. Manchester Rung in Spliced 152G. Moorgate Rung in Spliced 150G. New Gloucester Rung in Spliced 151G. Oxfordshire Rung in Spliced 134G. Painswick Rung in Spliced 106G. Preston Rung in Spliced 144G. Quex 28 - 2 - 70 Birmingham Cathedral 61E. Redcliffe Rung in Spliced 129G. Ribbleton Rung in Spliced 145G. Shropshire Rung in Spliced 149G. Strathclyde Rung in Spliced 146G. Swindon Rung in Spliced 116G. Trafalgar Rung in Spliced 105G. Trafford Rung in Spliced 131G. Trowbridge Rung in Spliced 124G. Uxbridge Rung in Spliced 112G. Verulam Rung in Spliced 147G. Warwickshire Rung in Spliced 110G. Wensleydale Rung in Spliced 114G. Wexham Rung in Spliced 140G. Worcester Rung in Spliced 128G. Worcestershire Rung in Spliced 133G. Worsley Rung in Spliced 118G. Xenia Rung in Spliced 136G. Yarmouth Rung in Spliced 108G. Zelah Rung in Spliced 111G. Fulham Rung in Spliced 162G. Leatherhead Rung in Spliced 159G. Leicestershire Rung in Spliced 161G. Newgate Rung in Spliced 160G. York 13 -10 - 70 Handbells 157G. Yorkshire Rung in Spliced 158G. N.B.- The place notations of Gwent, Kingsthorpe, Raglan and Richmondshire Surprise Major, Avonmouth, Lanchester and Leyland Surprise Royal, and Cray Surprise Maximus were incorrectly published with peal reports. That of Christchurch Surprise Maximus has not been published.